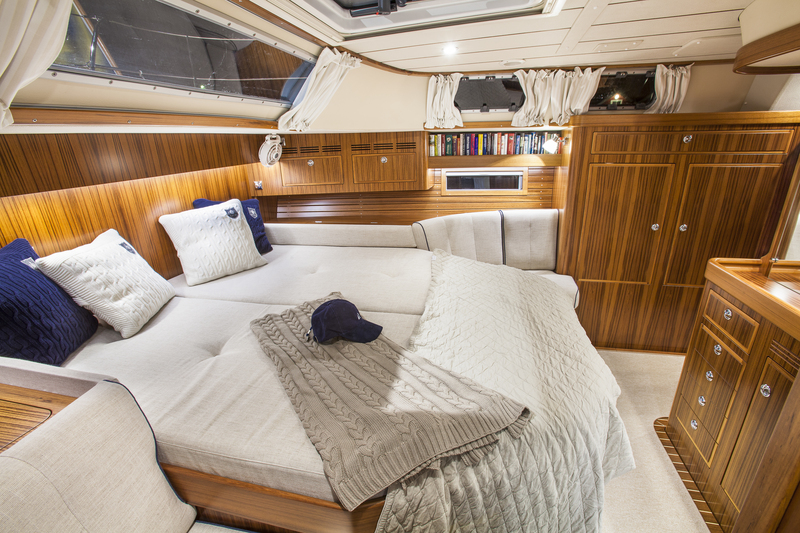 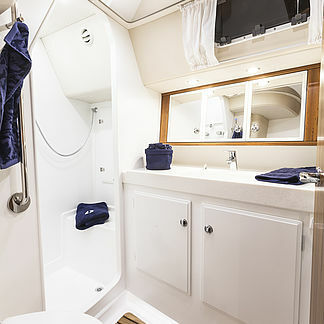 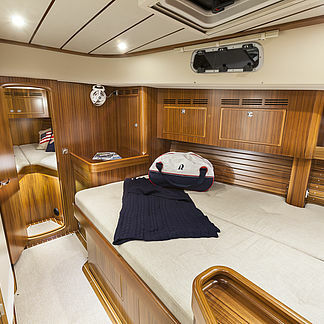 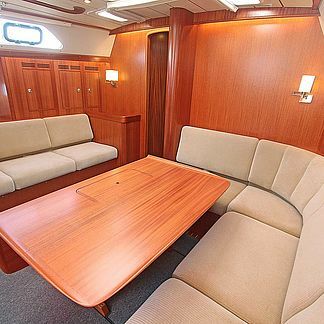 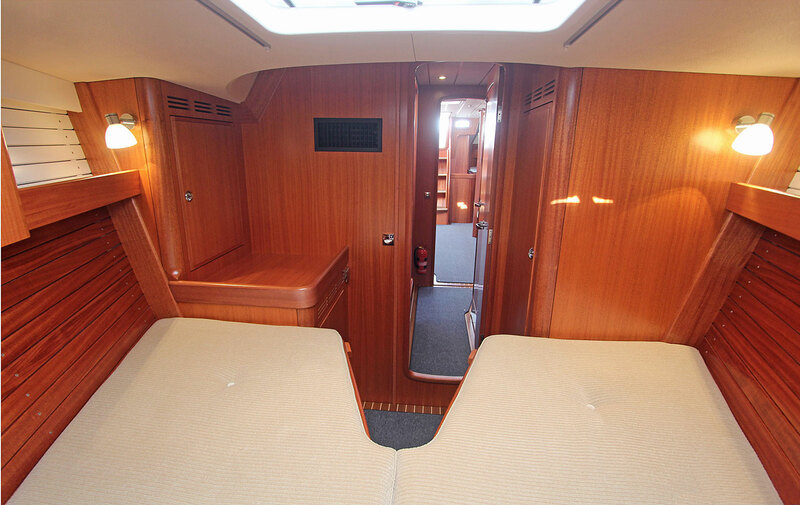 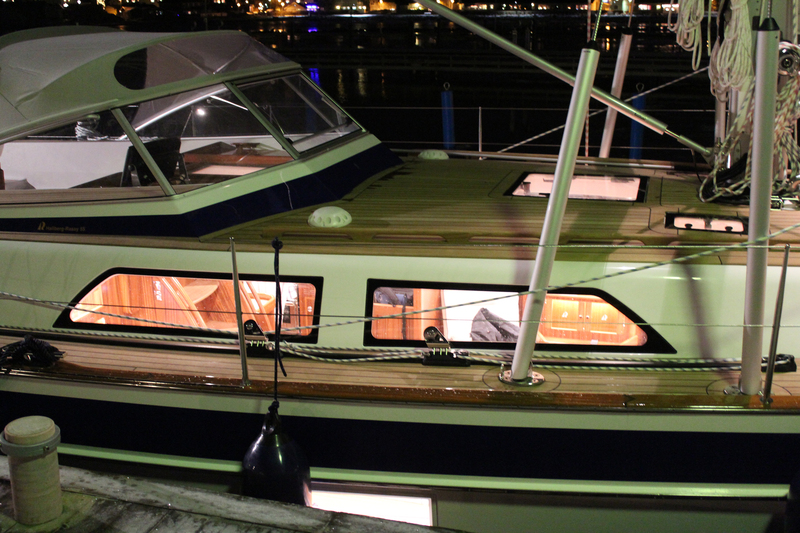 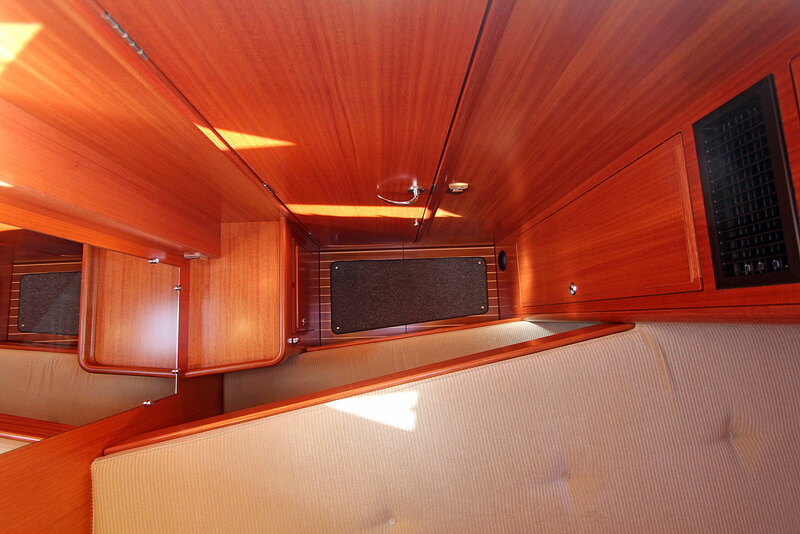 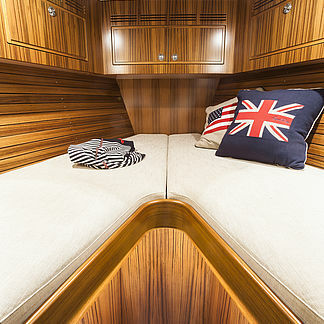 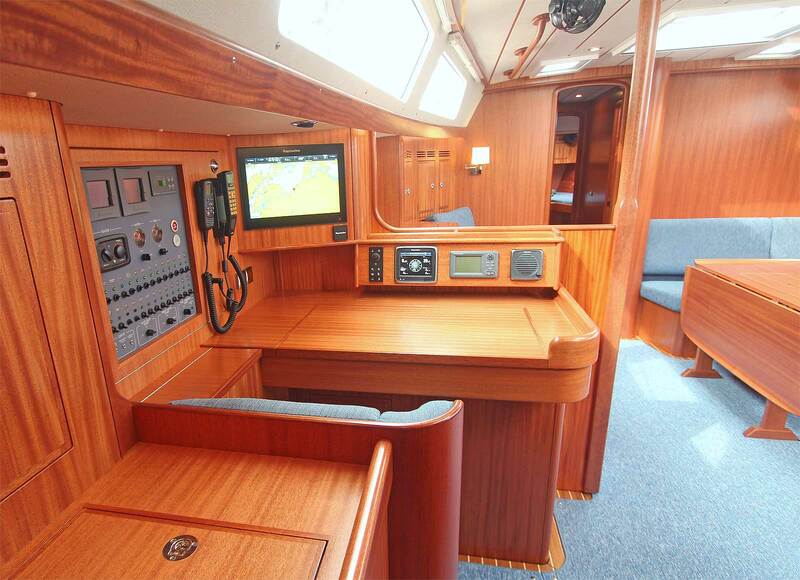 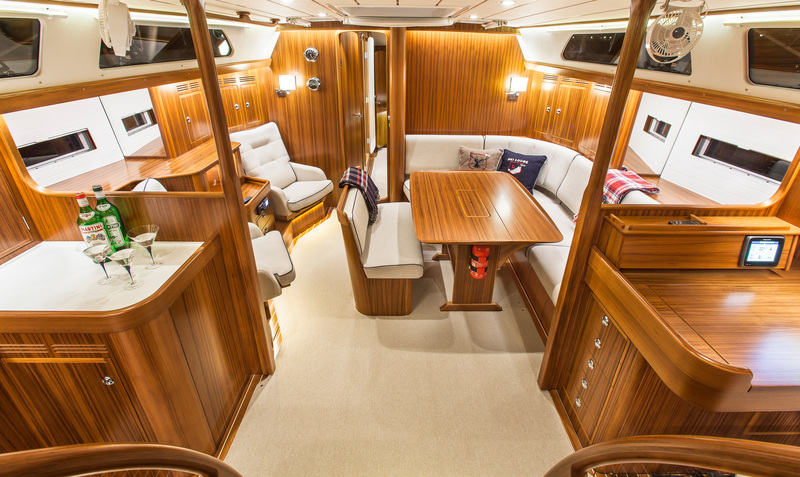 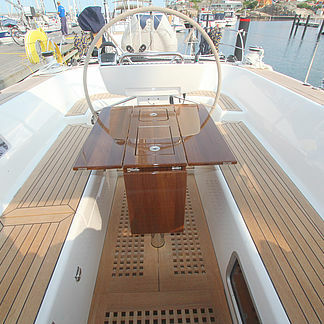 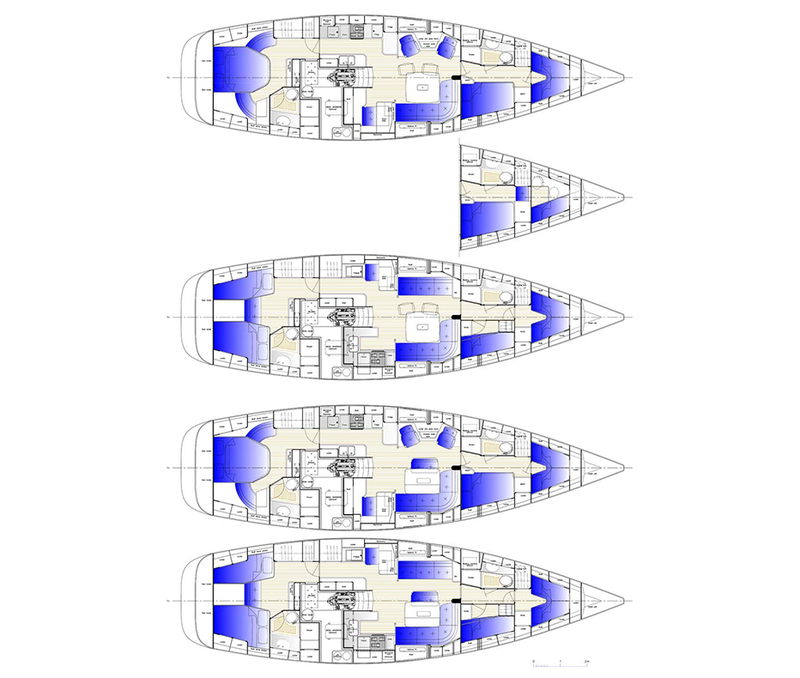 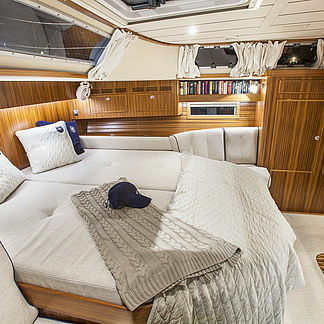 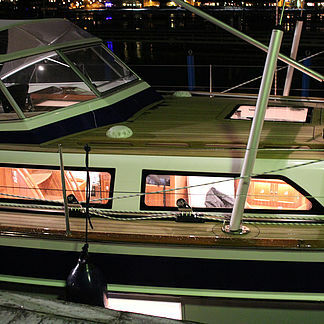 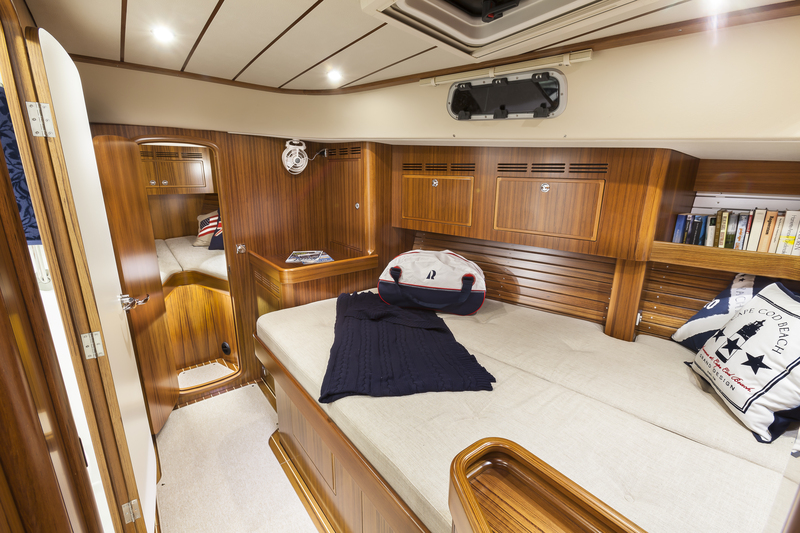 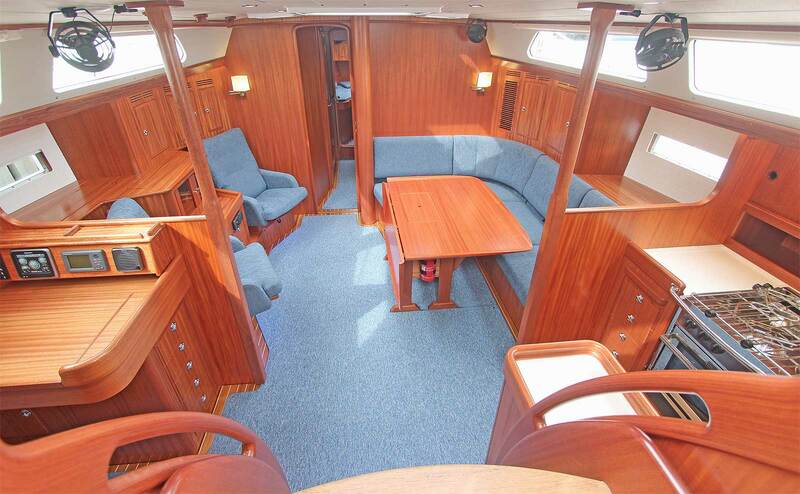 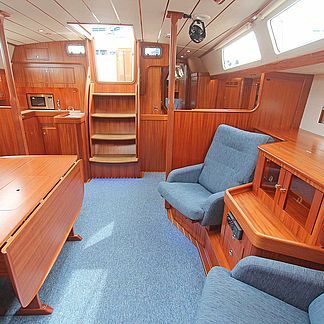 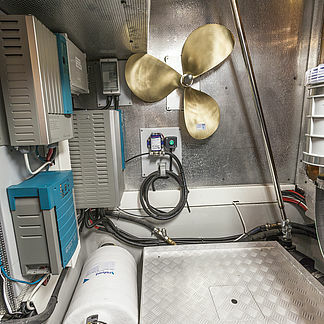 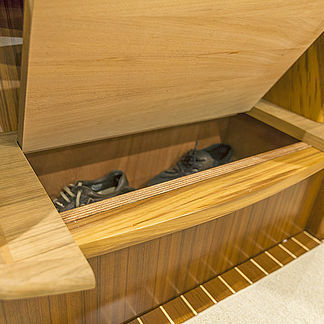 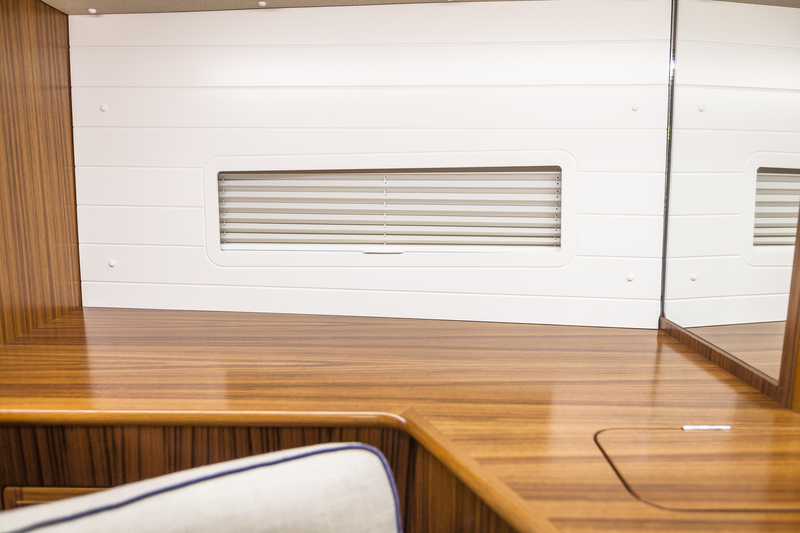 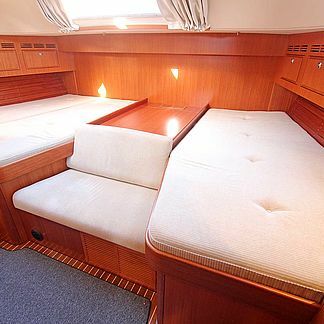 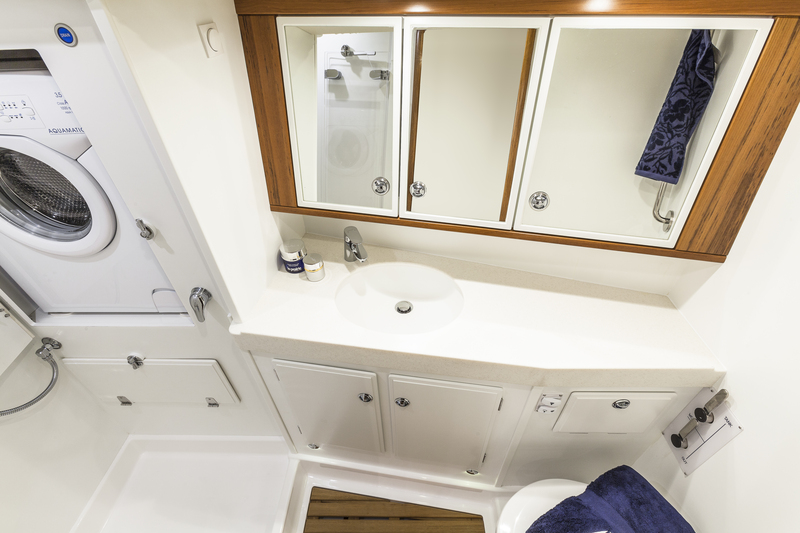 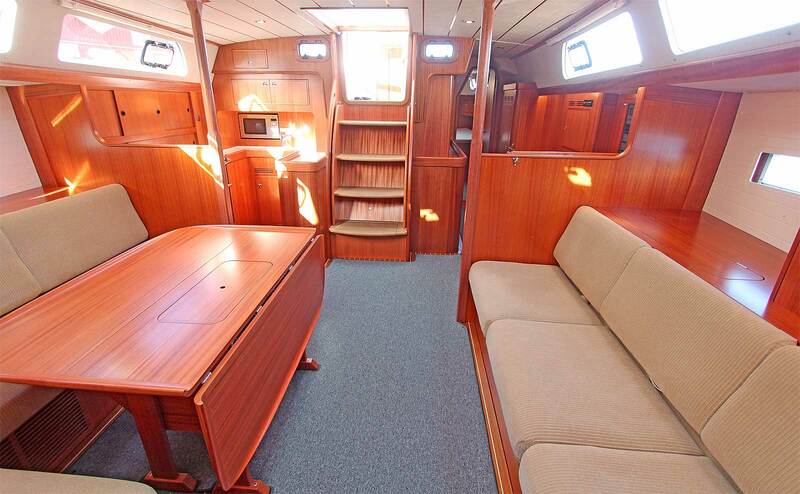 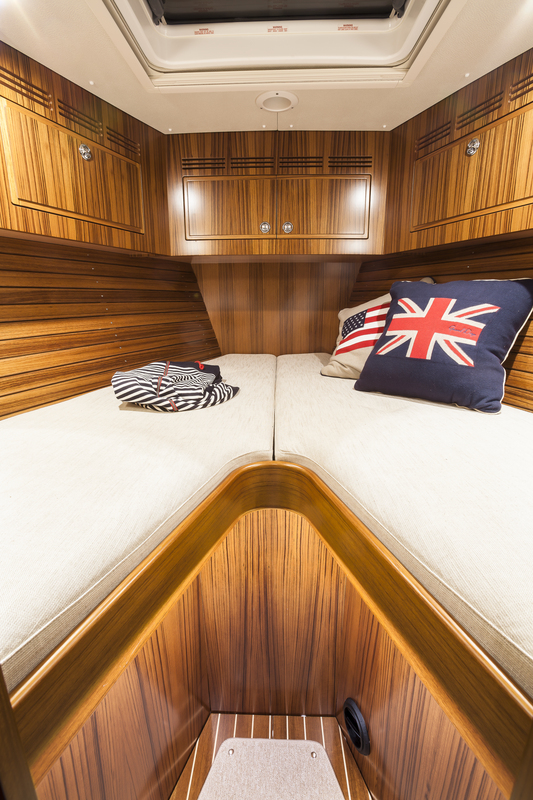 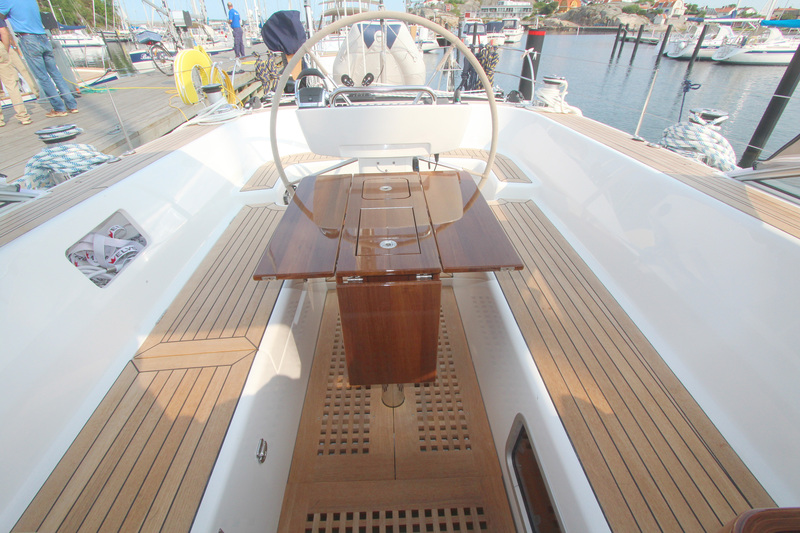 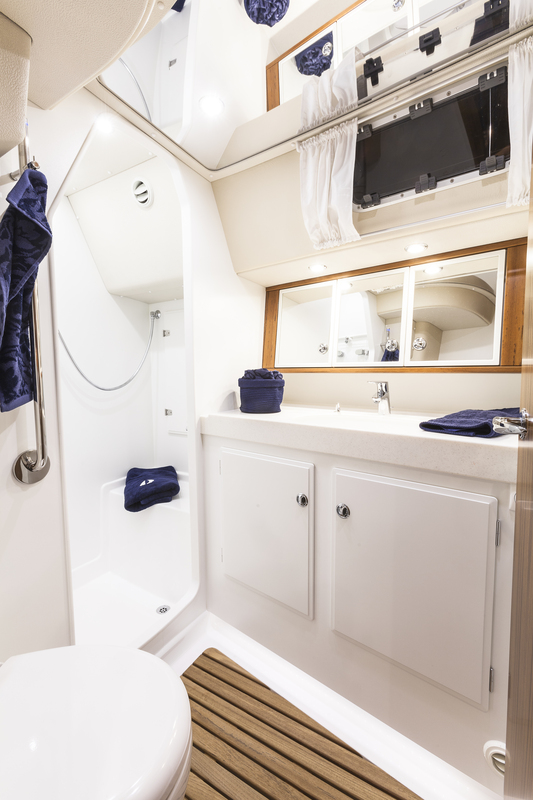 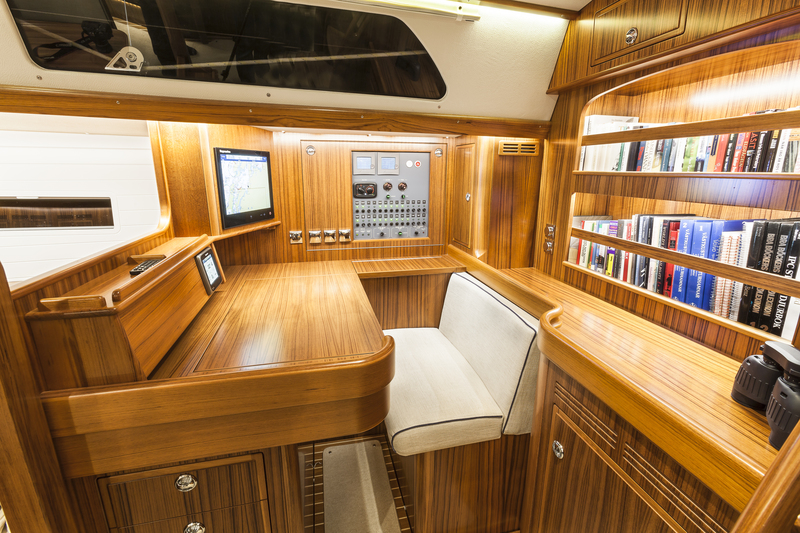 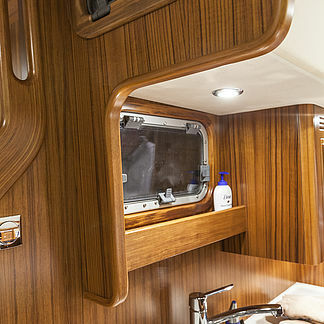 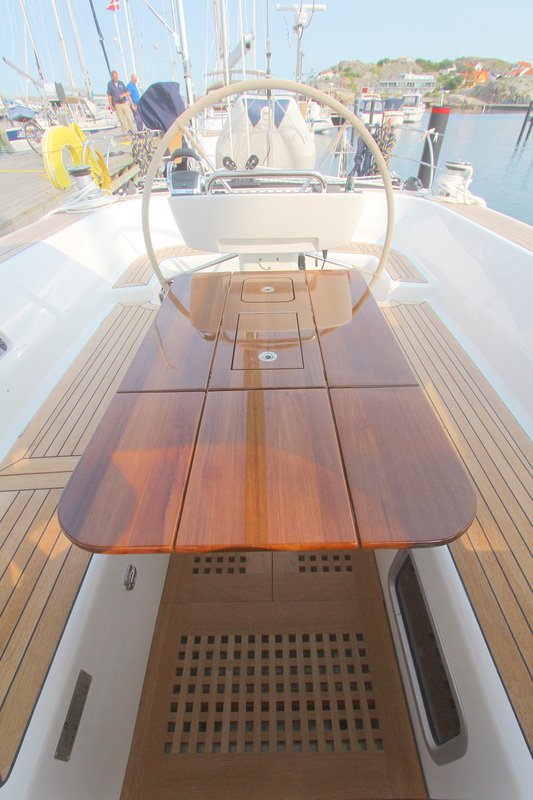 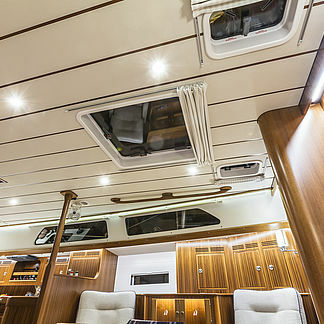 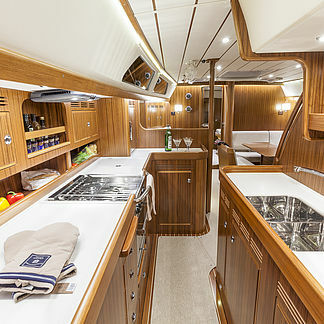 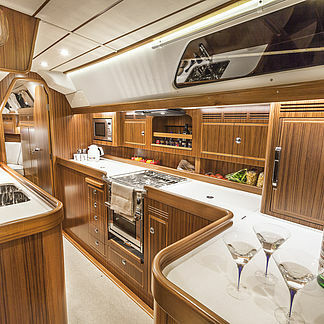 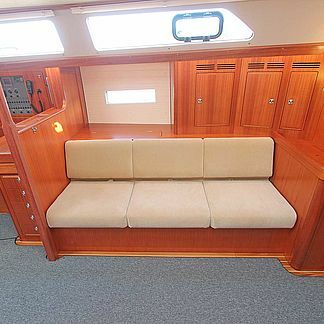 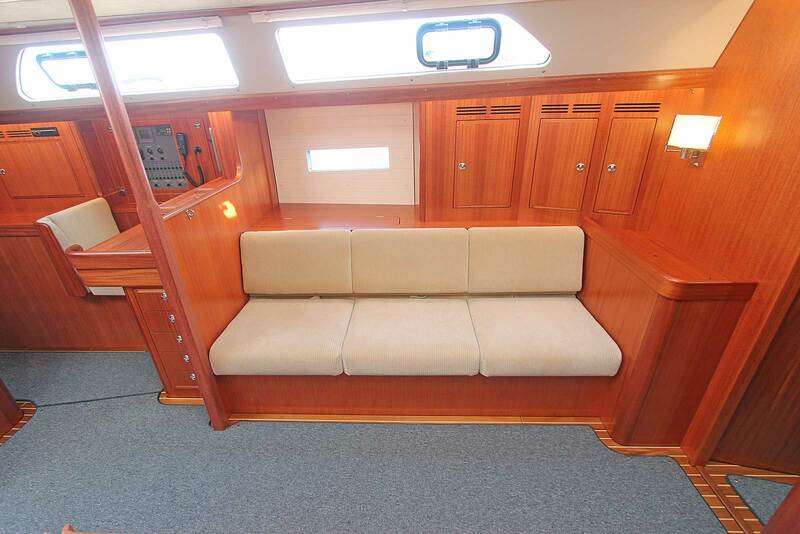 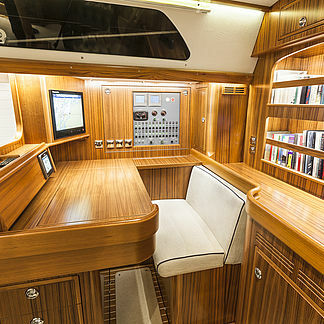 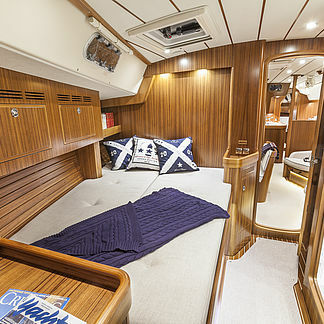 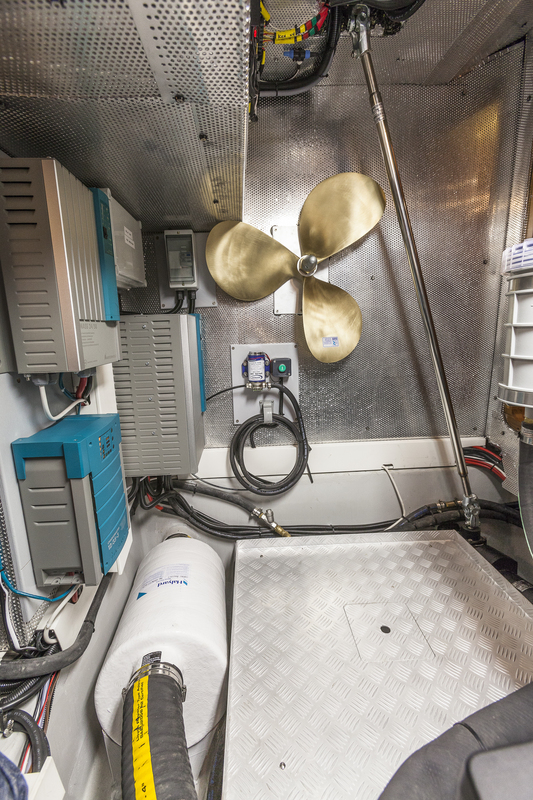 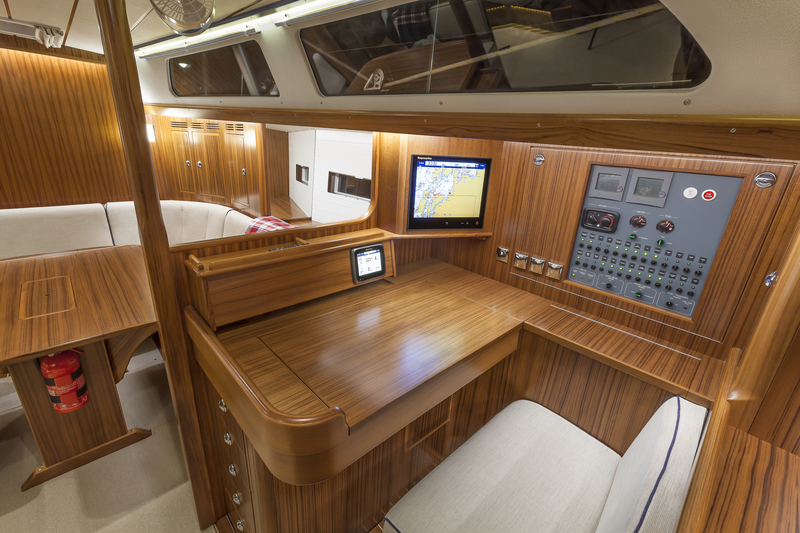 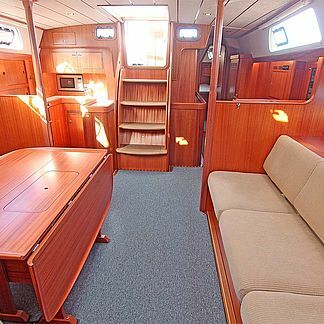 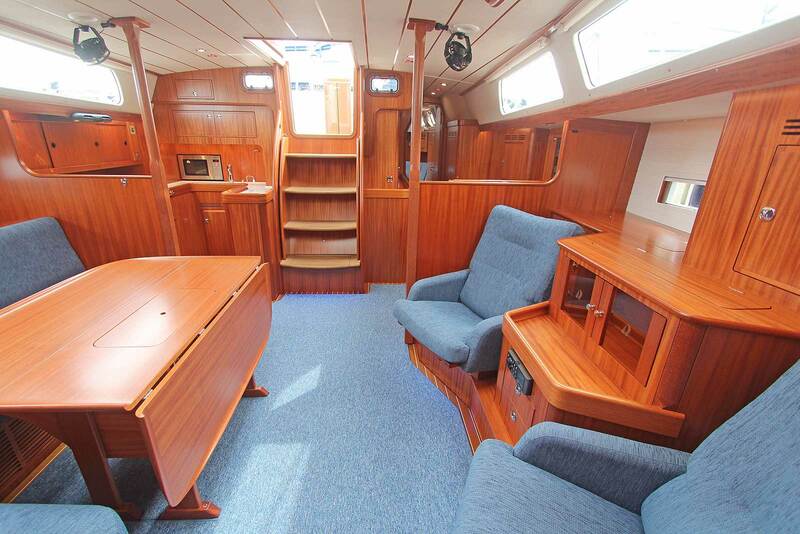 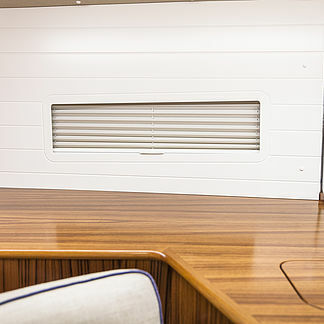 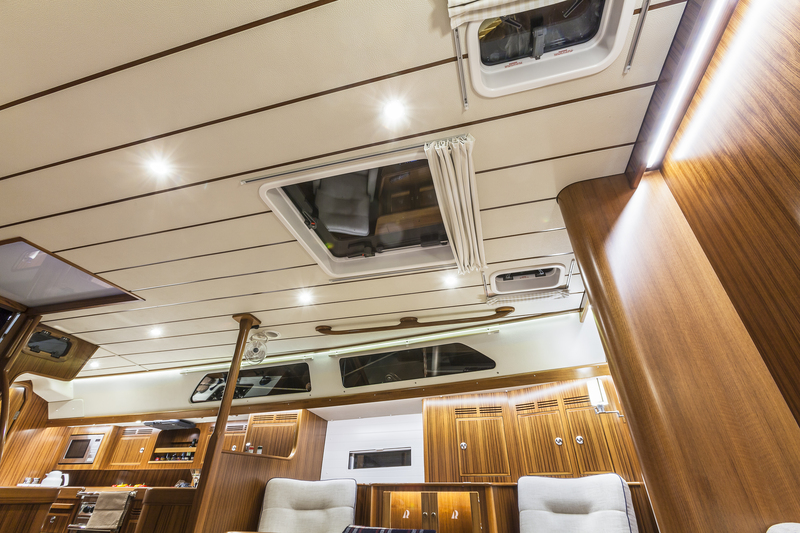 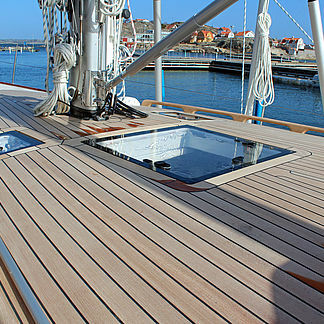 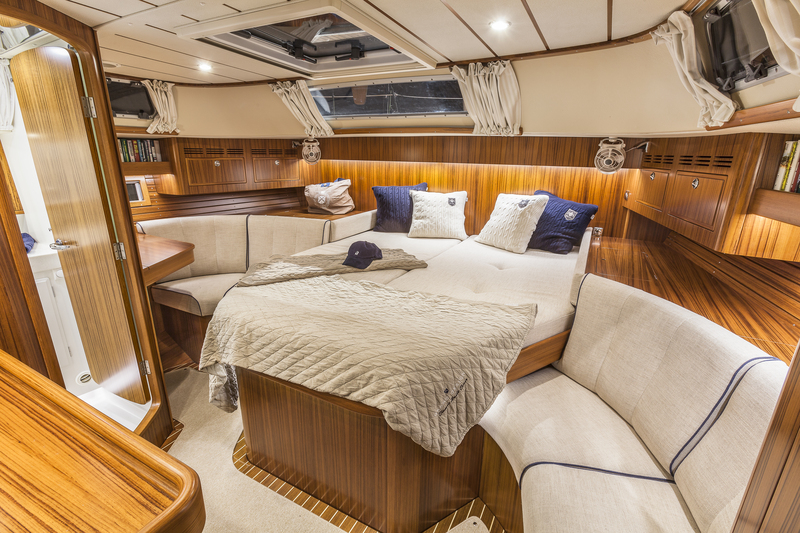 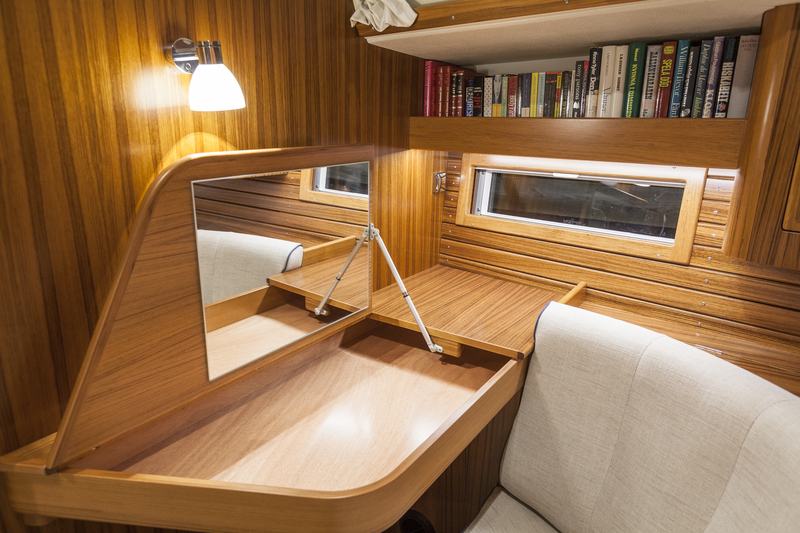 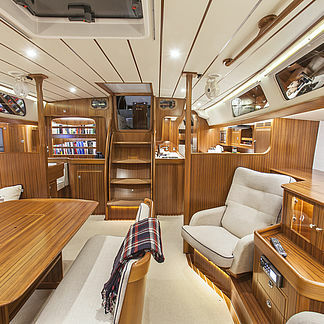 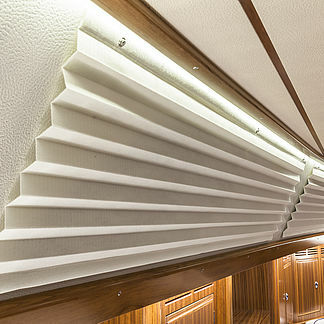 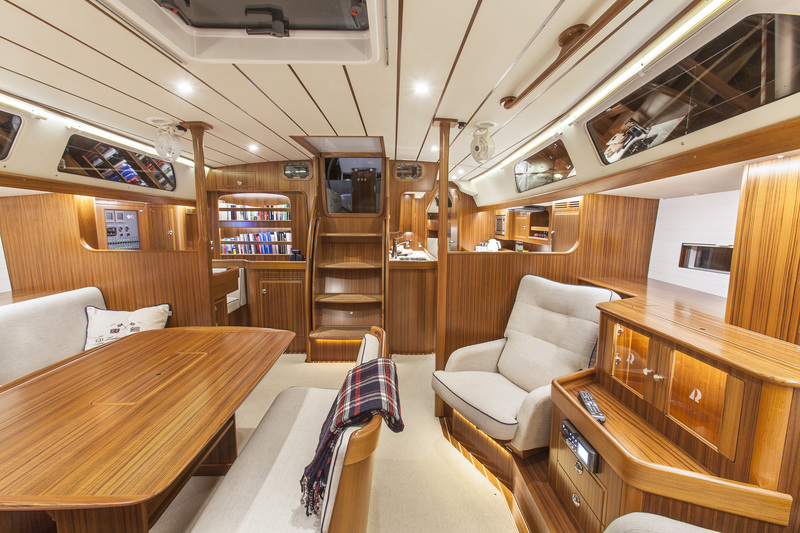 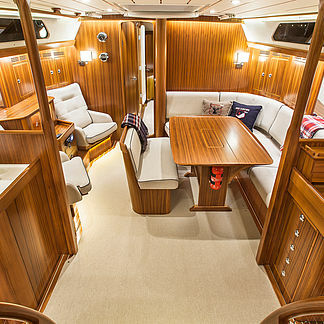 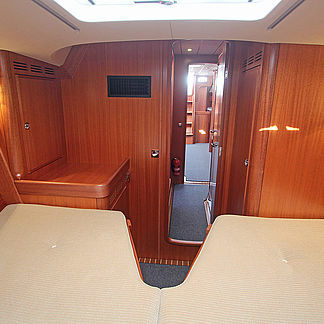 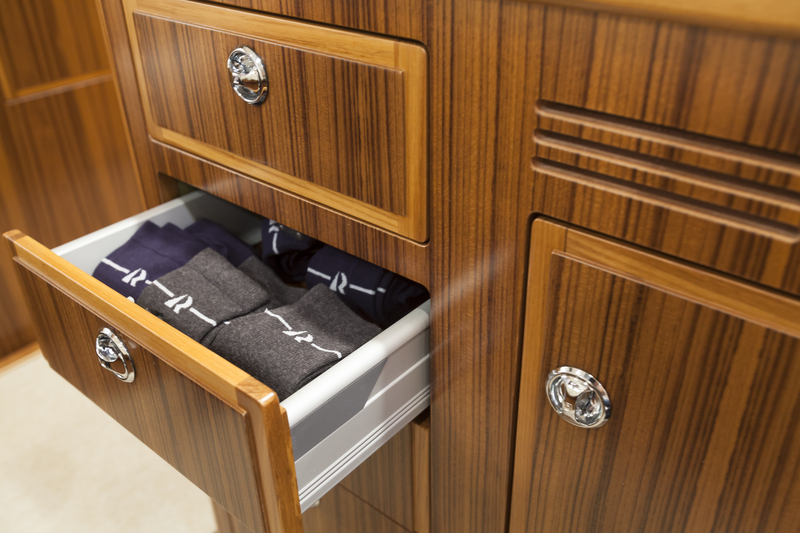 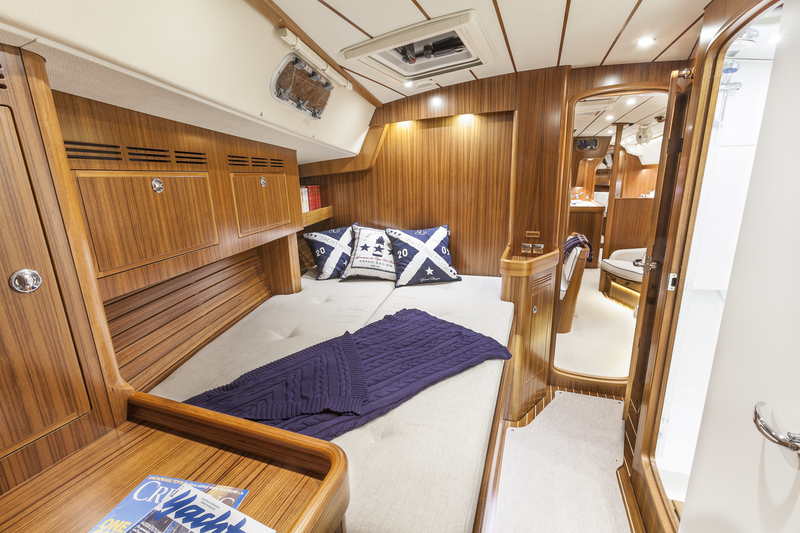 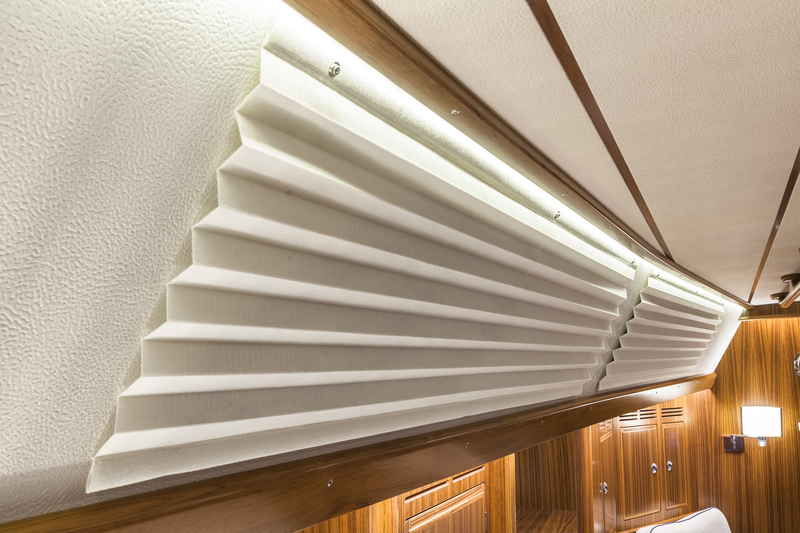 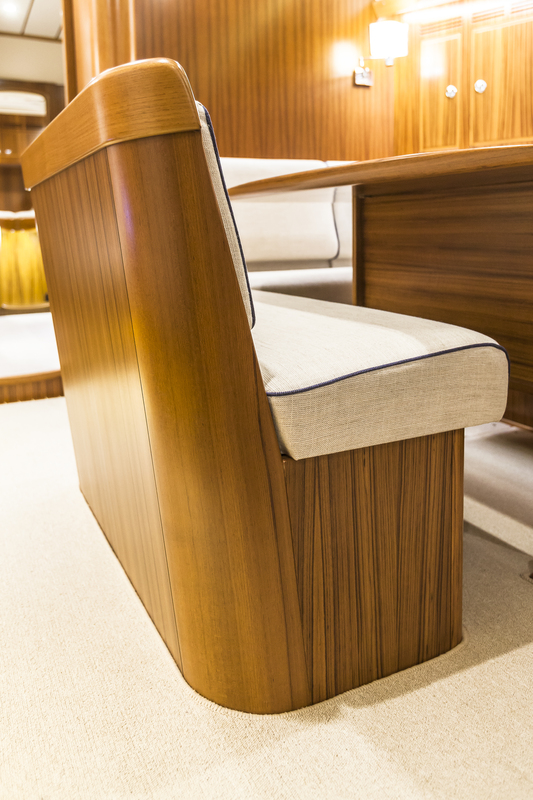 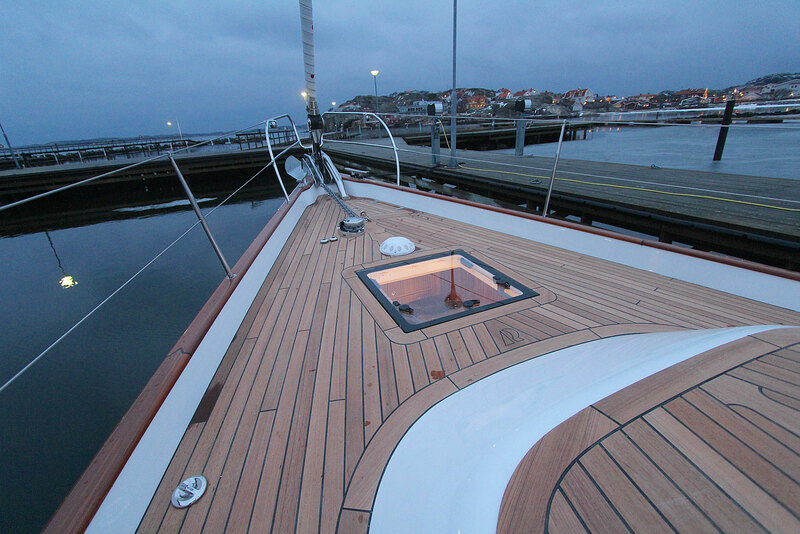 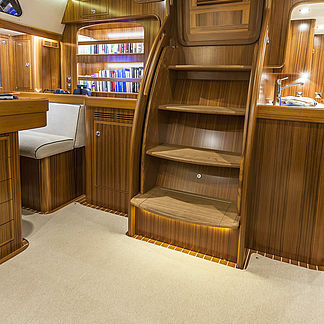 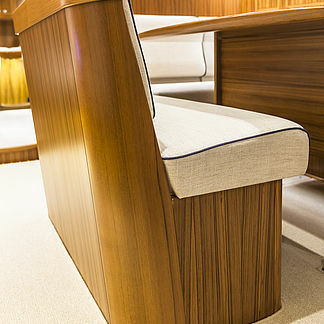 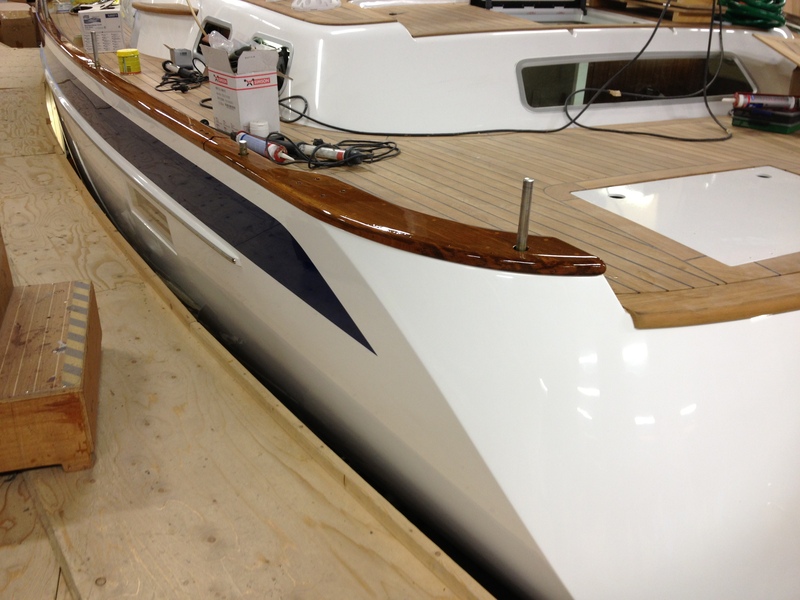 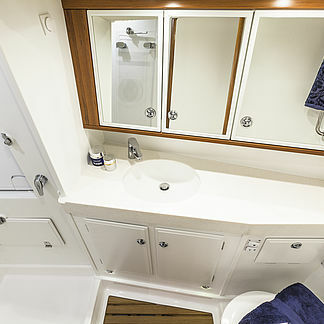 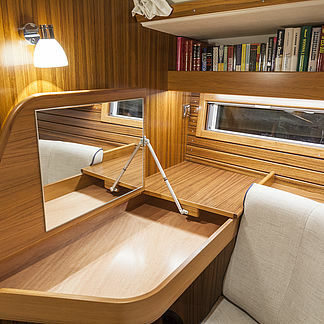 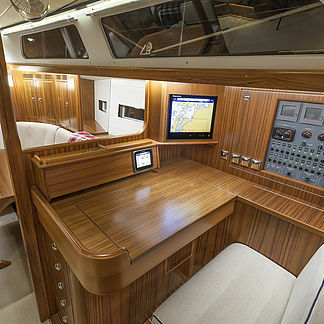 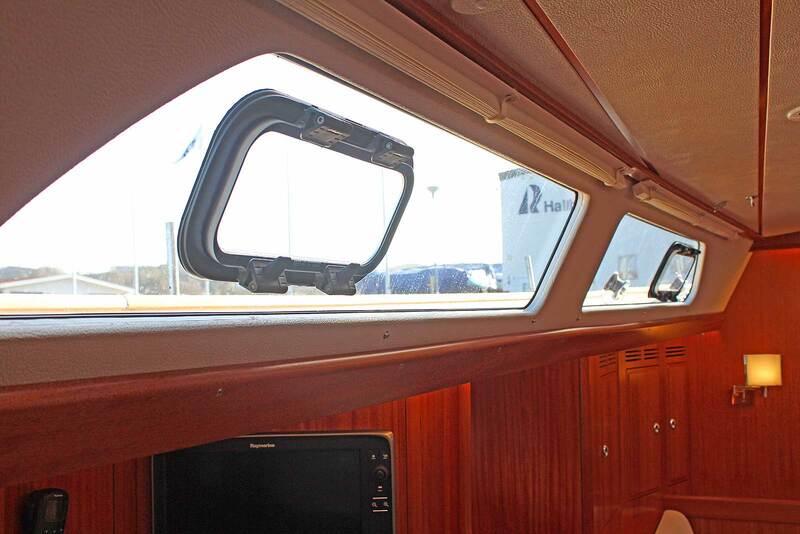 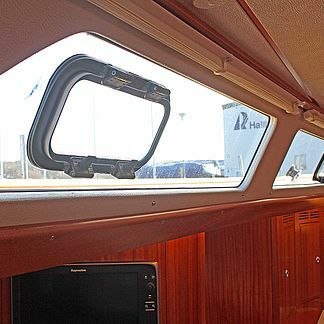 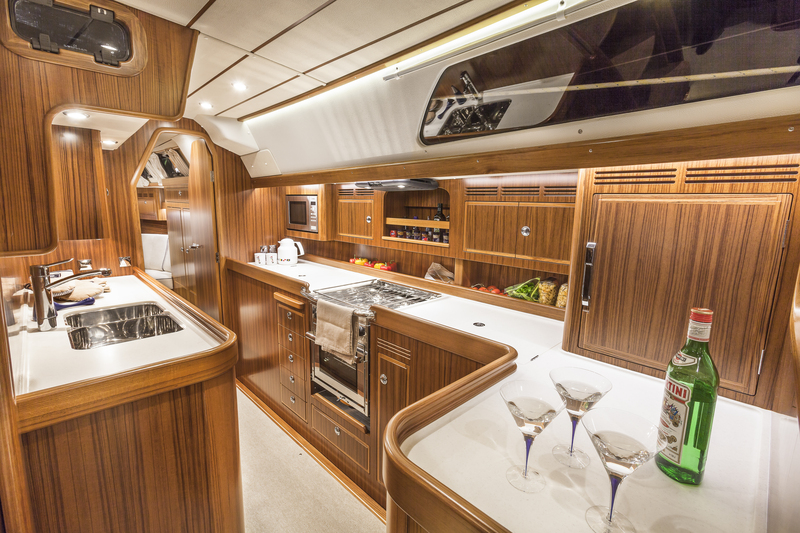 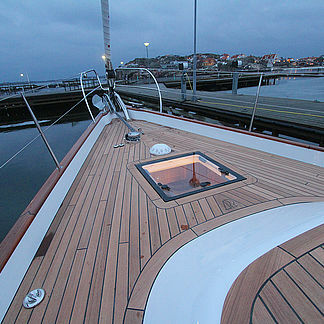 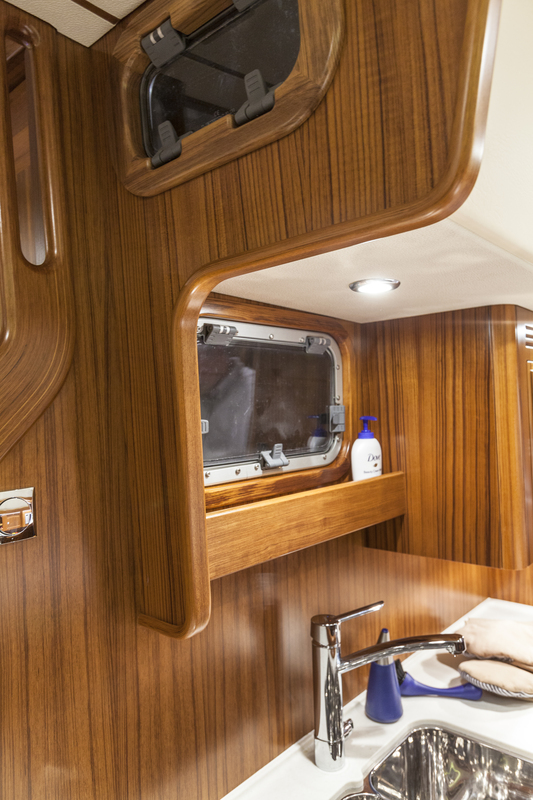 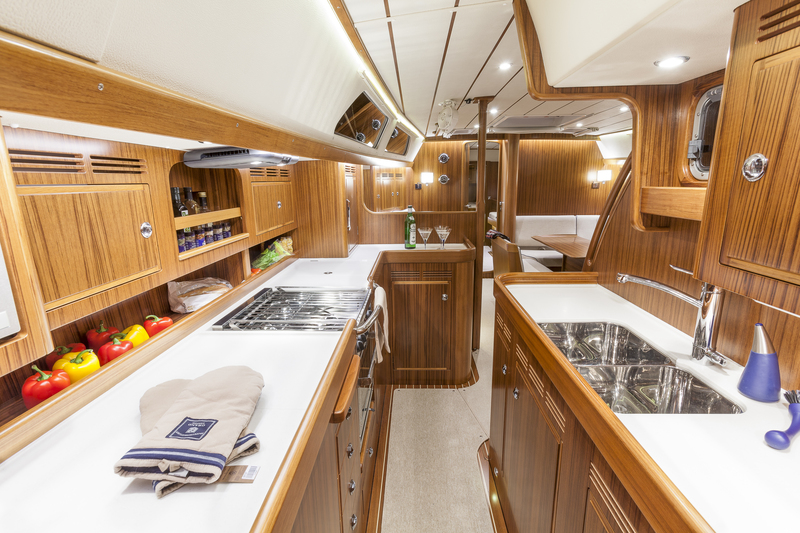 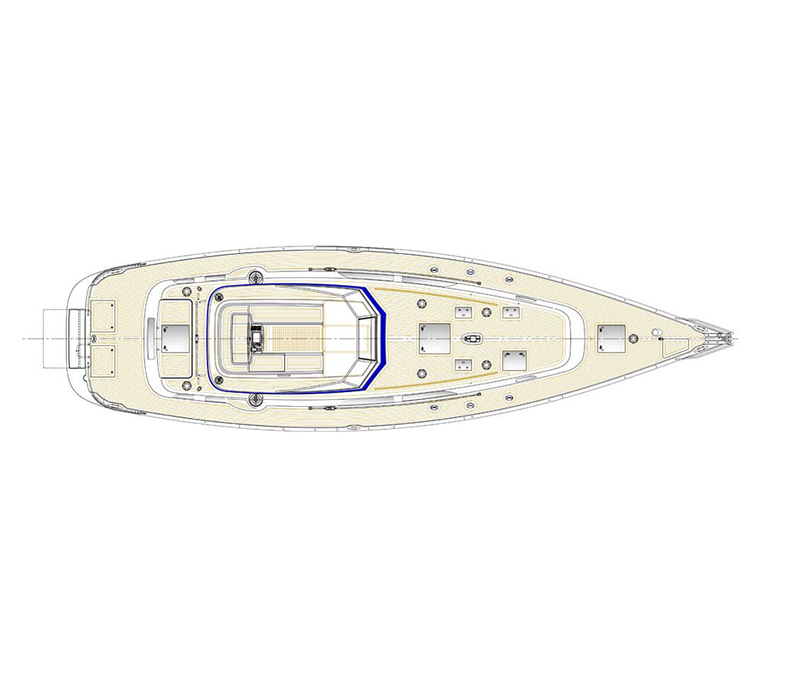 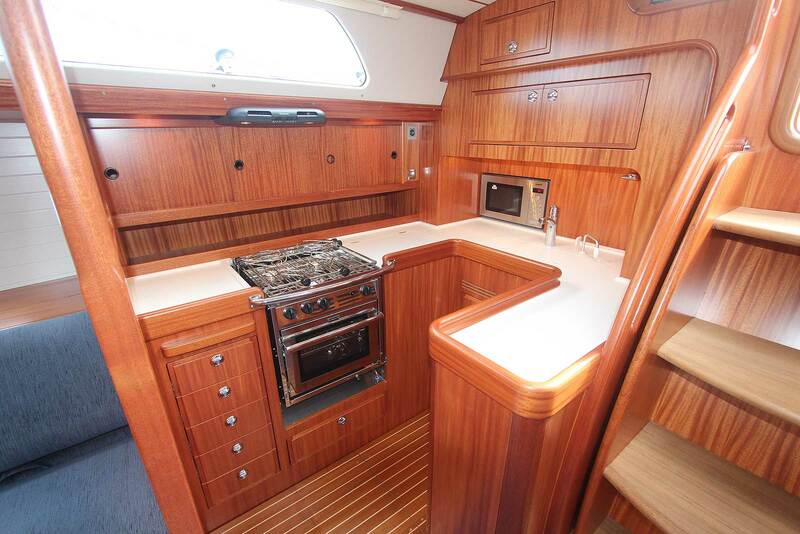 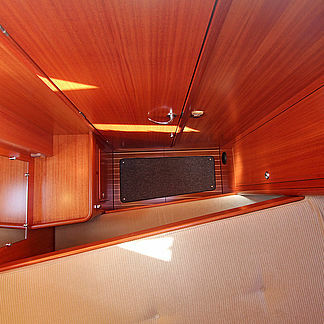 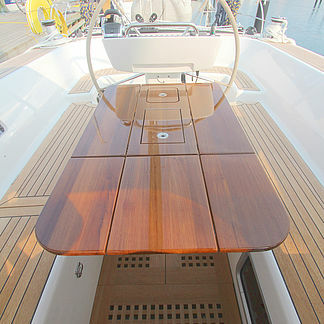 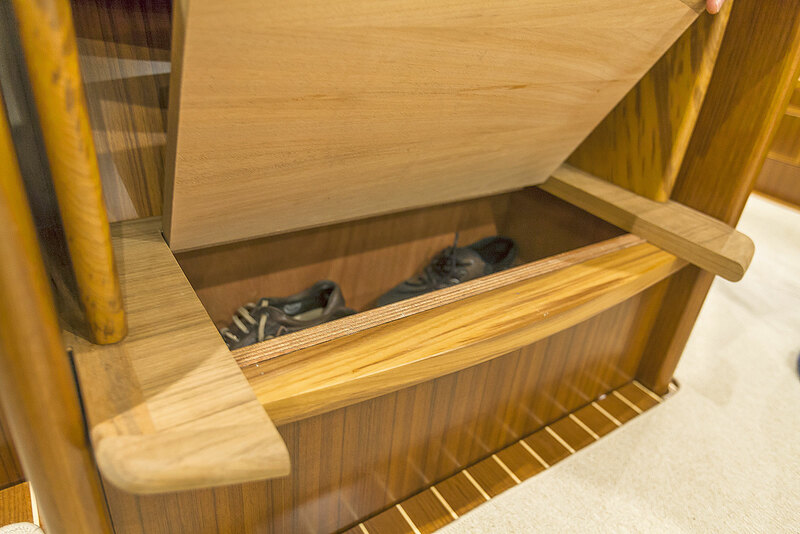 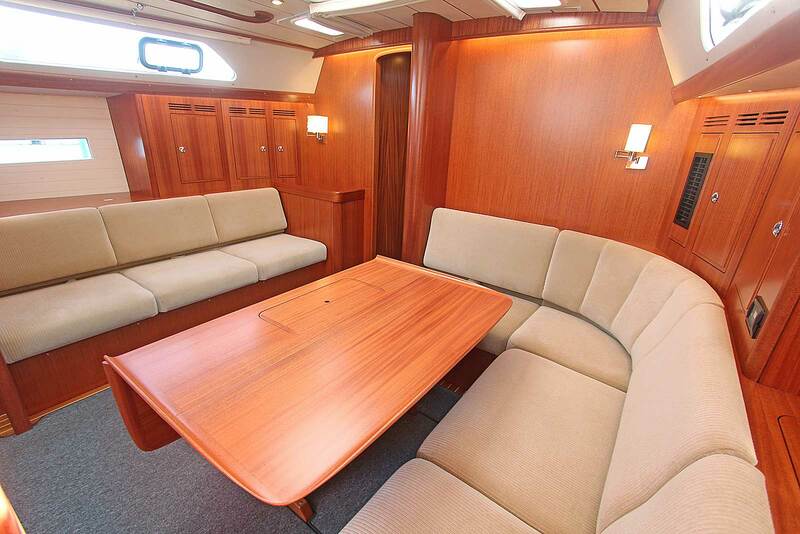 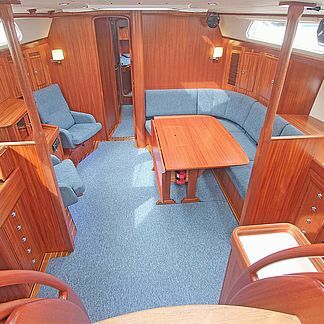 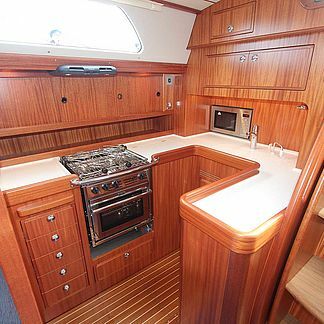 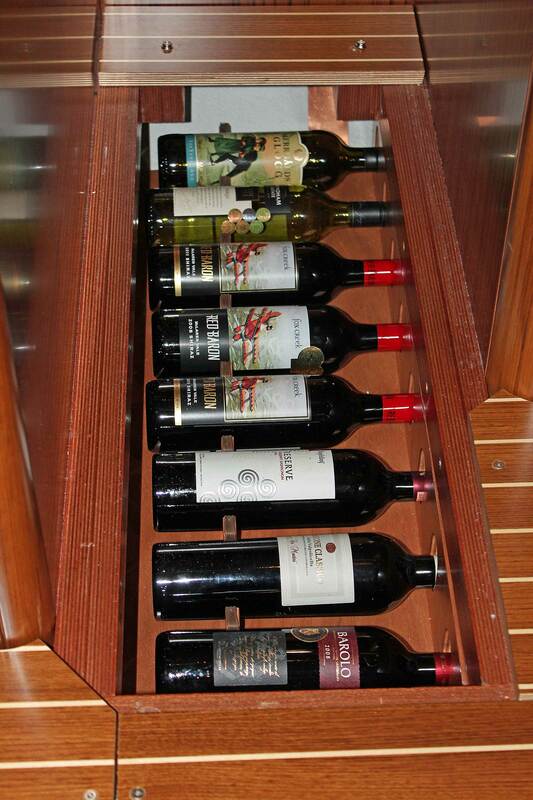 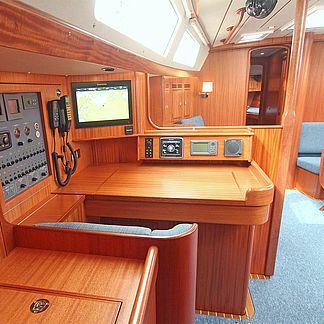 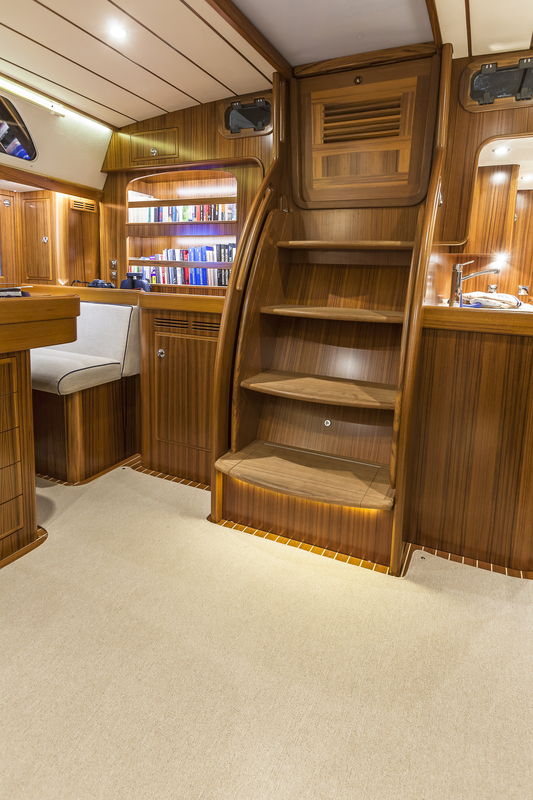 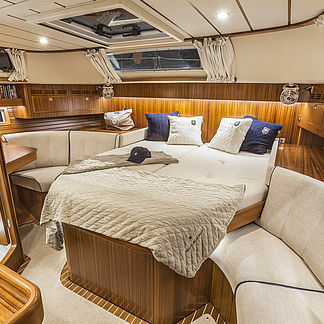 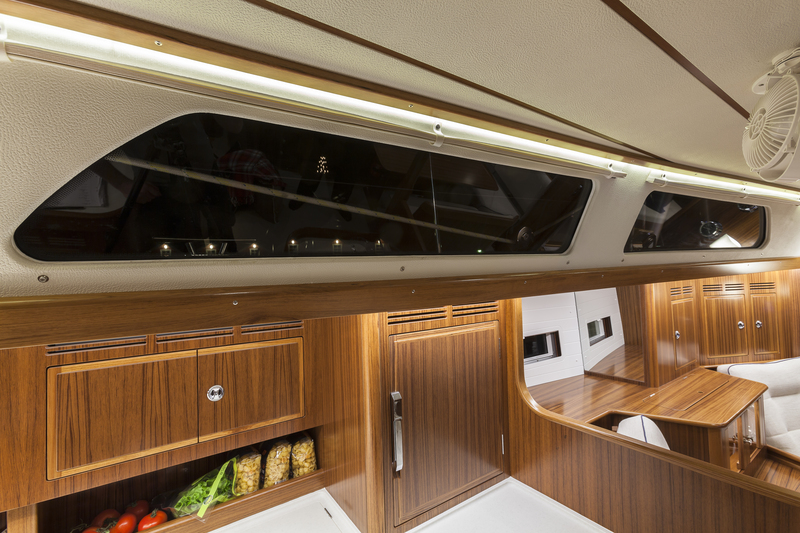 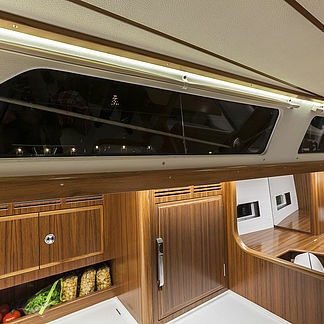 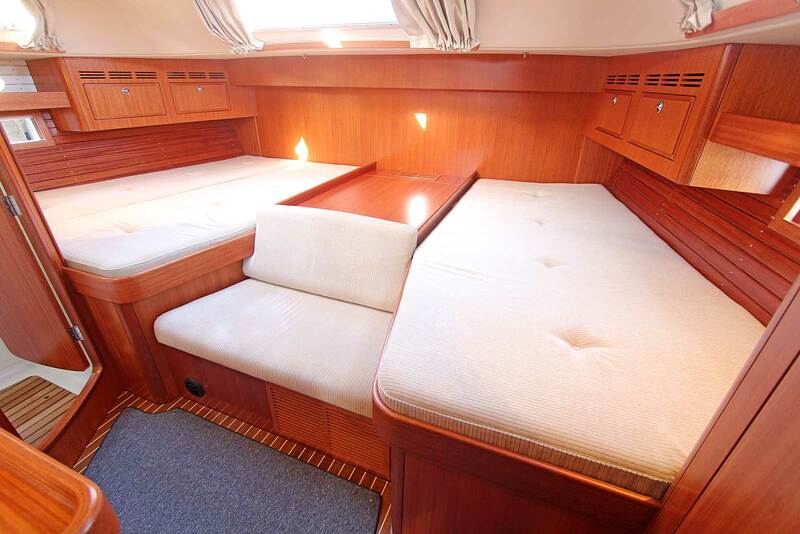 "LAID OUT FOR GREAT COMFORT FOR A SMALL CREW, WITH A VERY BRIGHT AND INVITING INTERIOR"
"I like this boat. 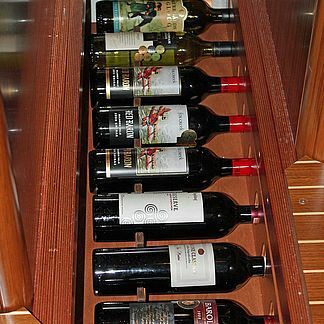 It satisfies my well-honed aesthetic requirements. 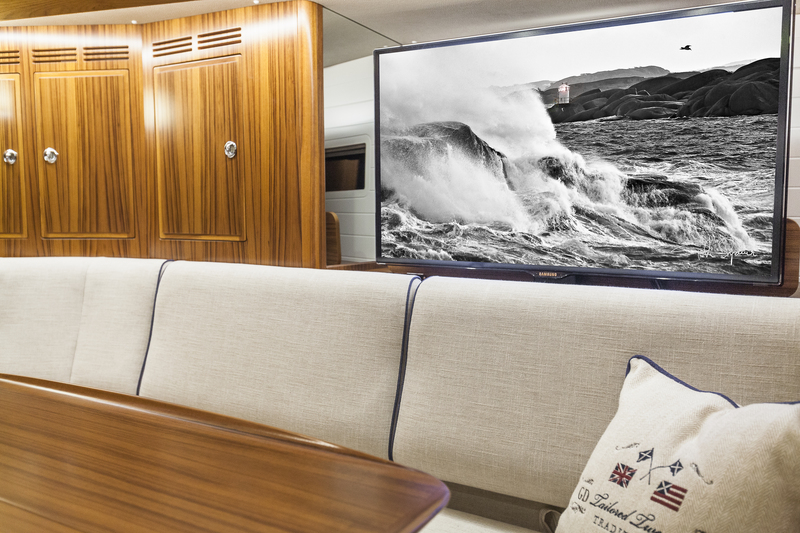 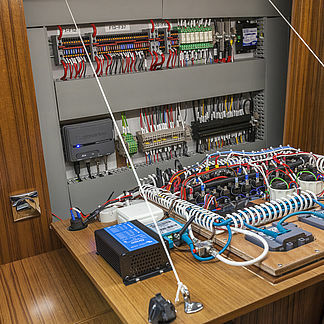 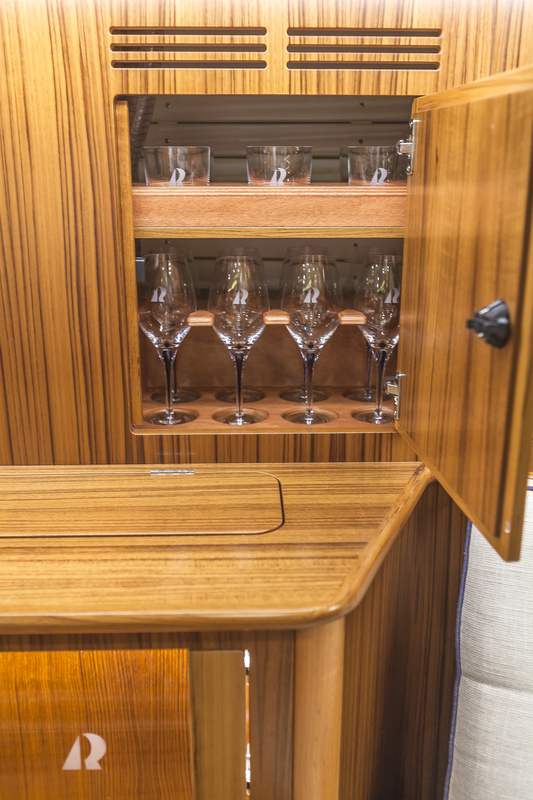 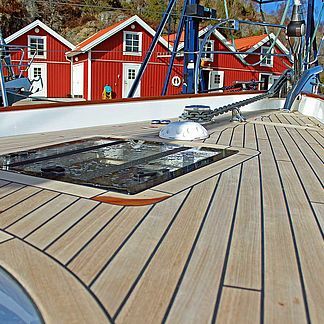 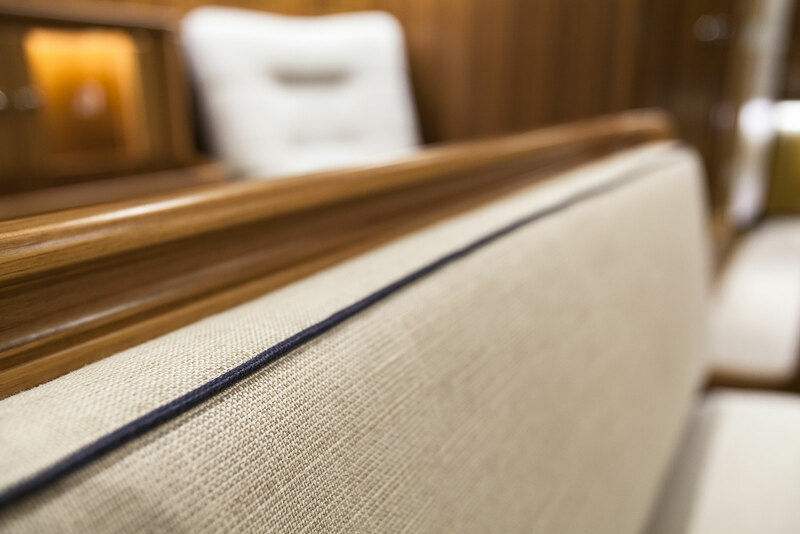 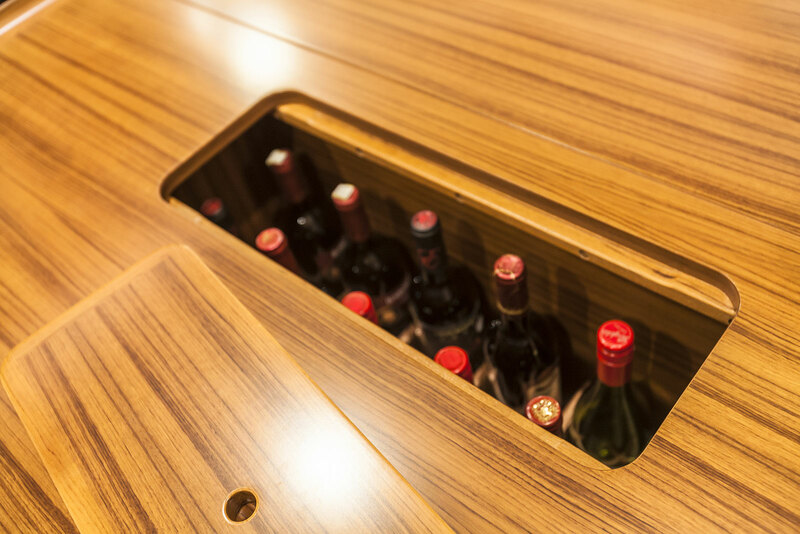 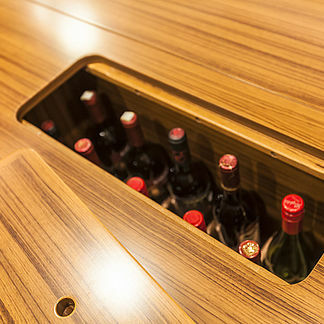 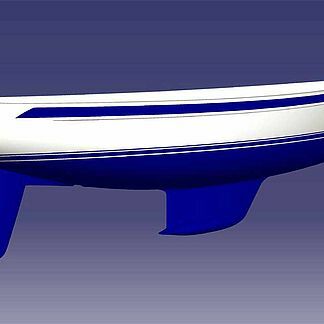 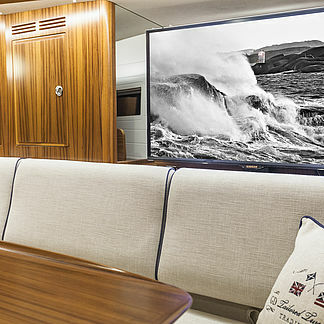 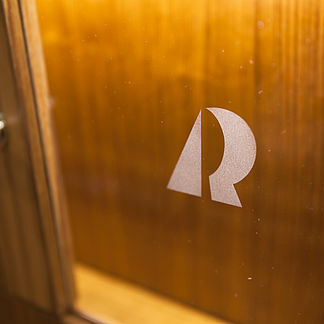 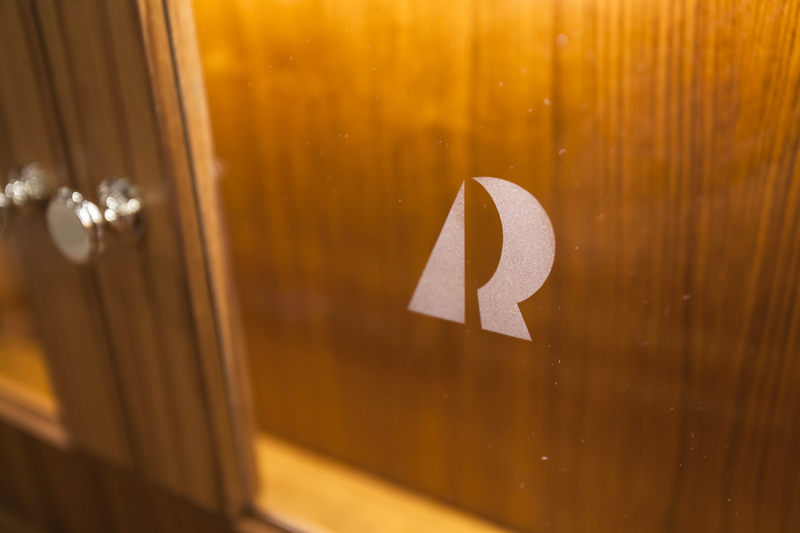 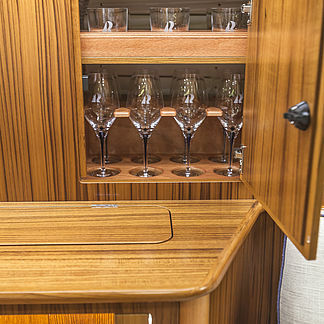 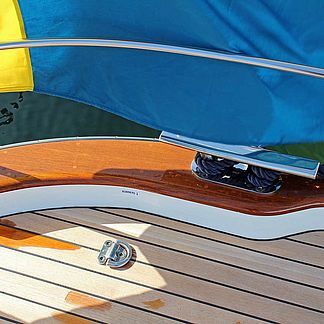 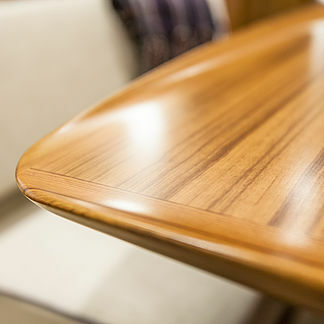 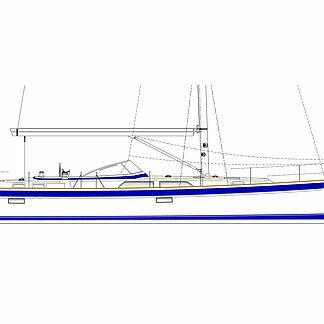 No surprise considering the design is by Germán Frers... Hallberg-Rassy is one of the only production builders left who I think build a true offshore cruising boat." 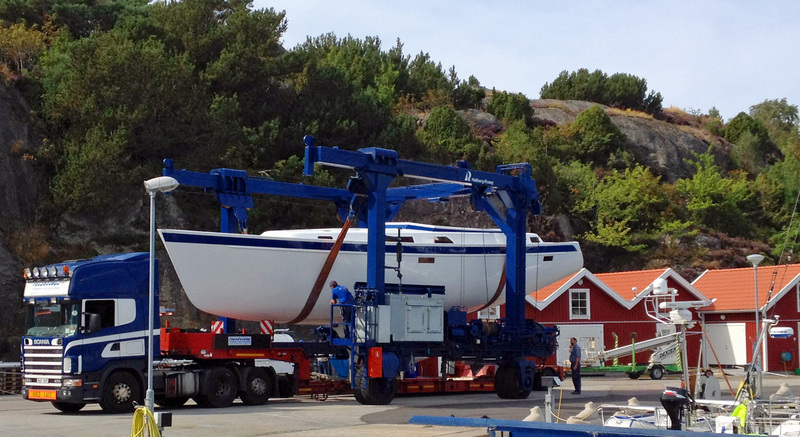 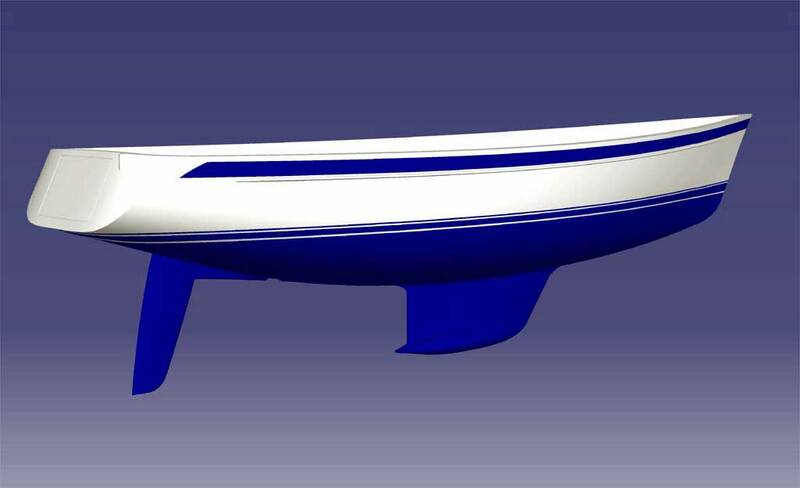 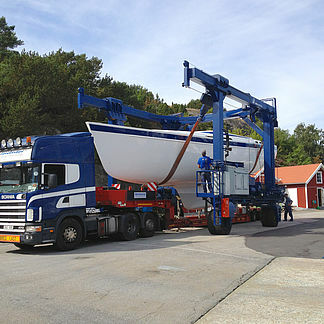 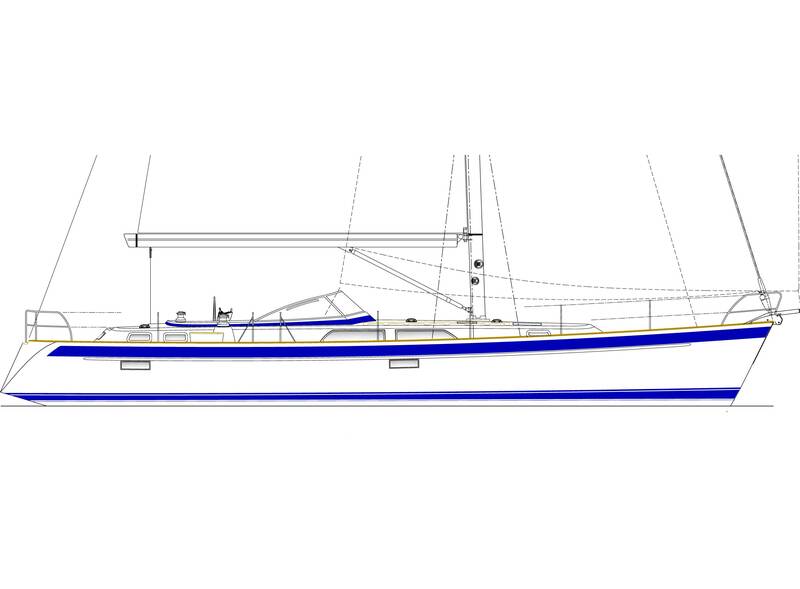 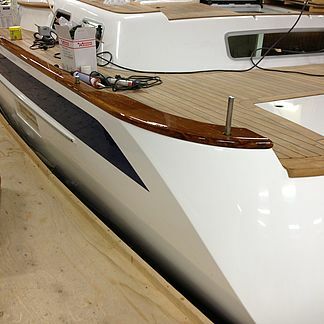 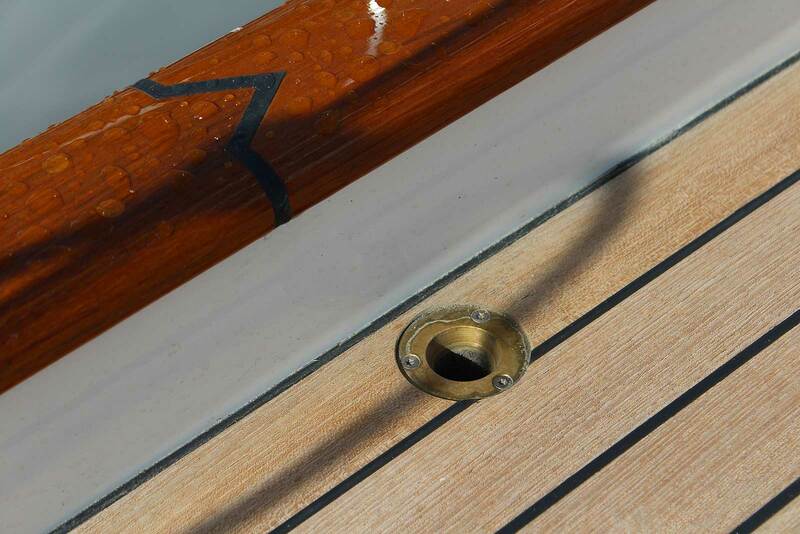 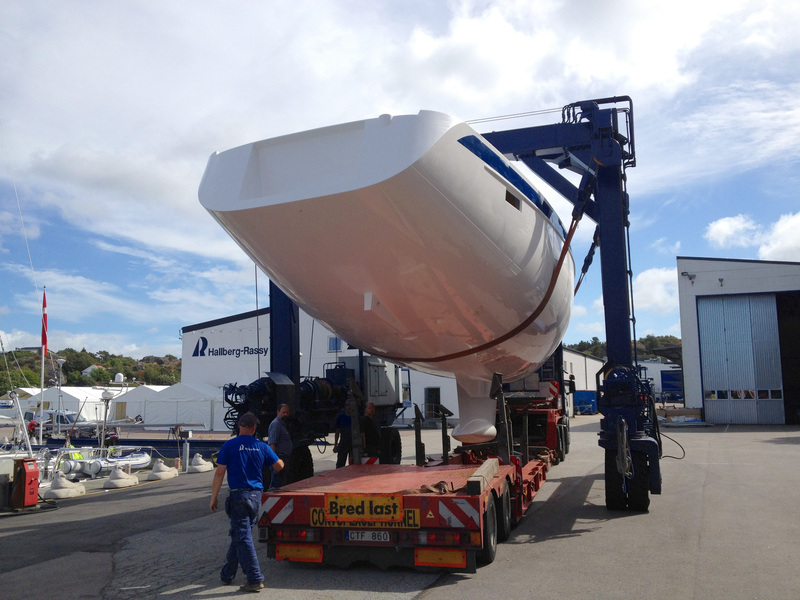 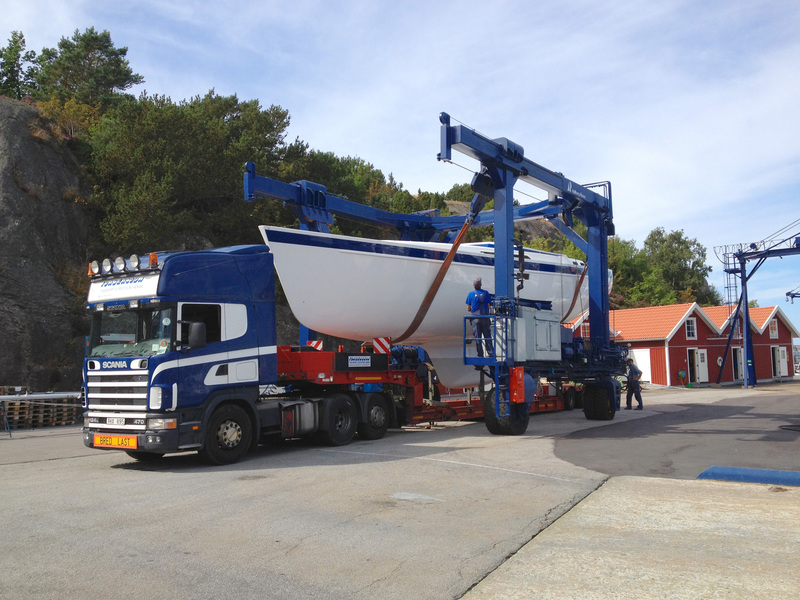 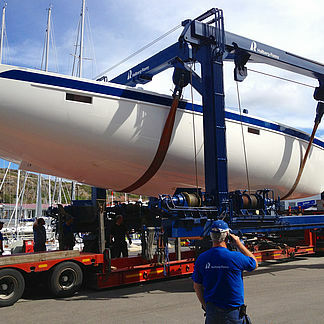 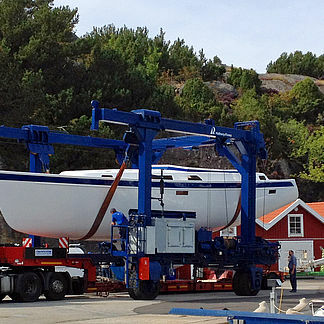 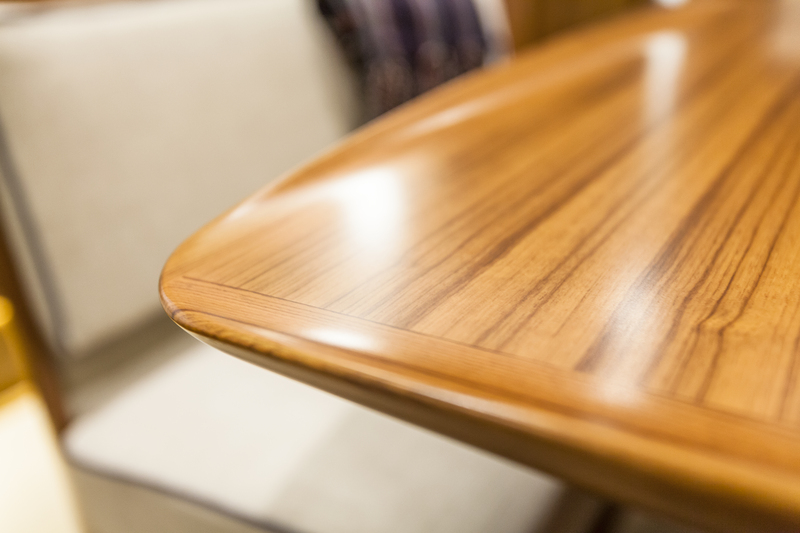 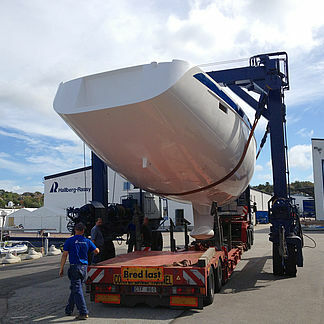 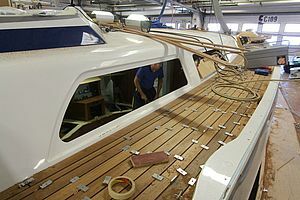 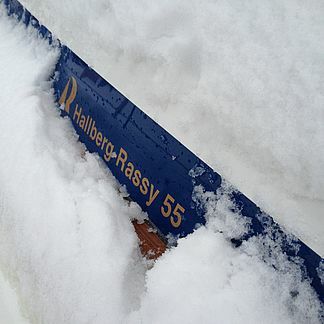 There are always many Hallberg-Rassy yachts under construction. 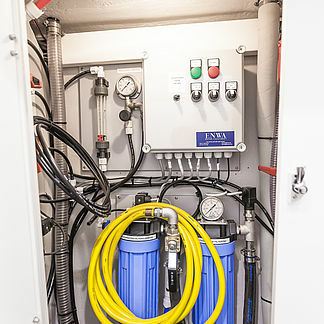 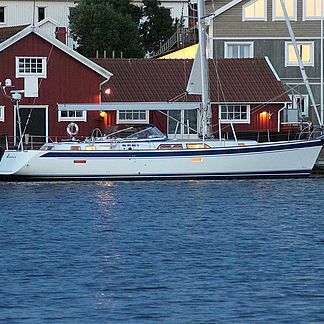 Please appoint a time for viewing at the yard in Ellös, Sweden. 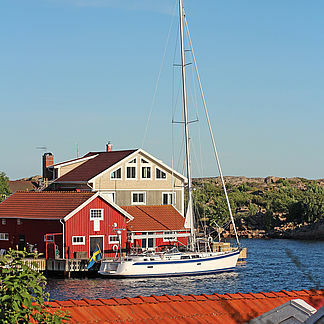 The yard is always worth a visit. 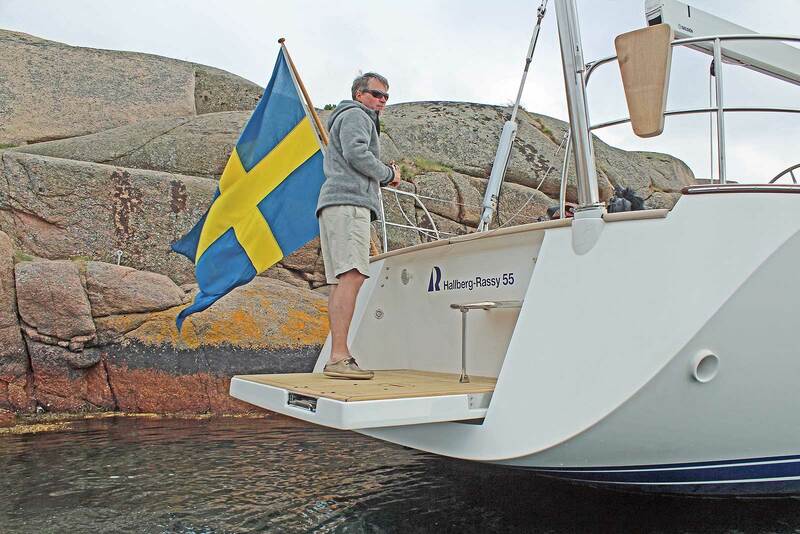 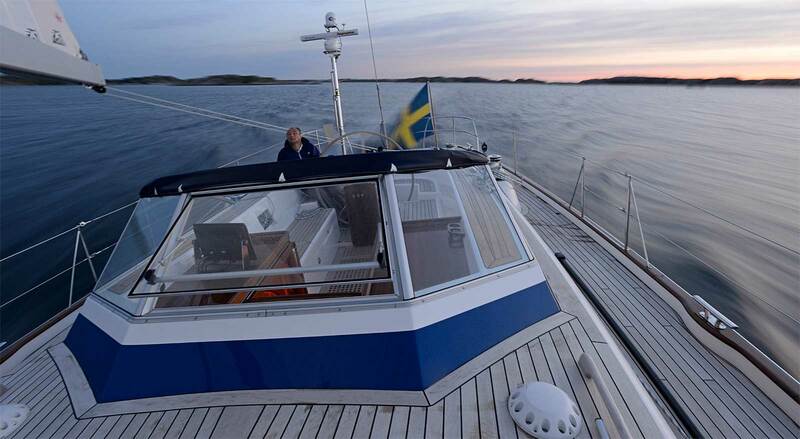 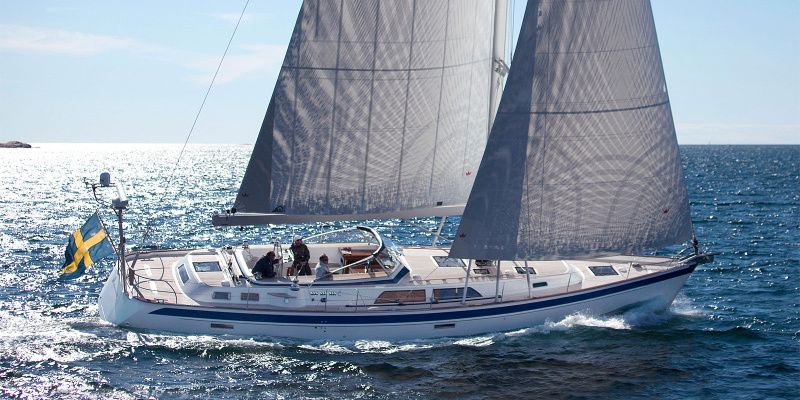 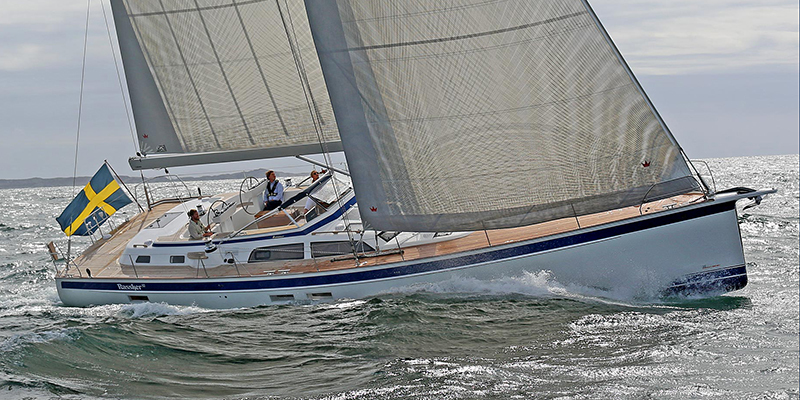 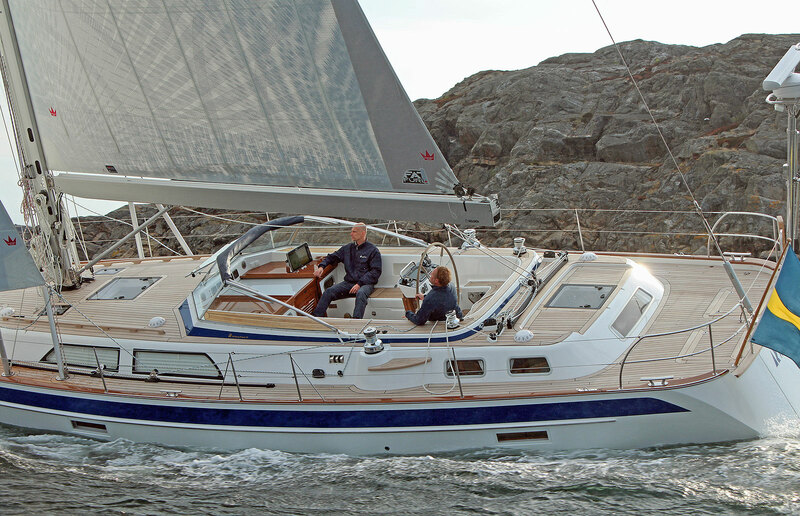 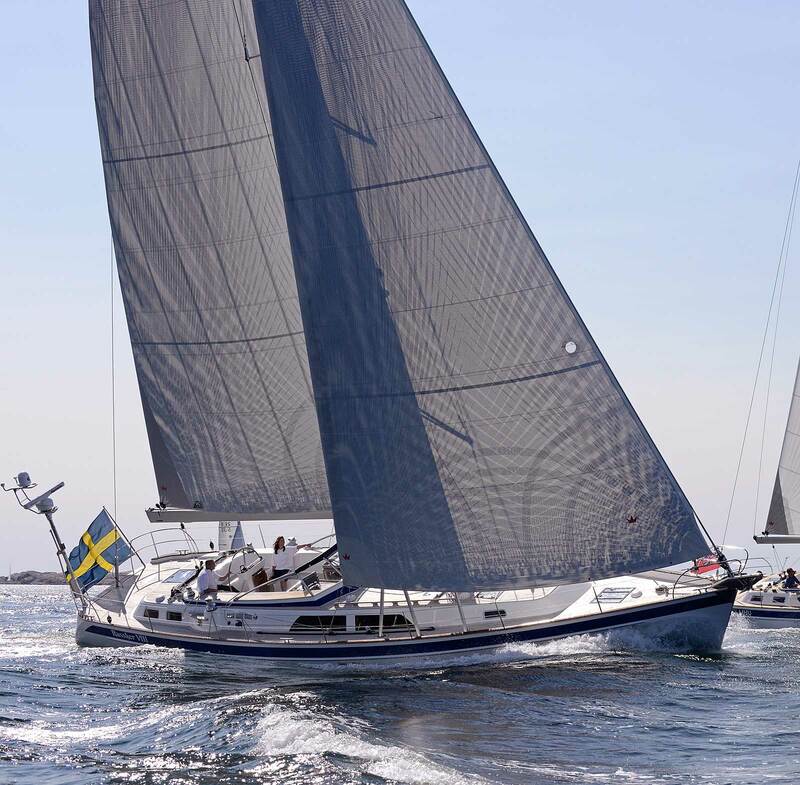 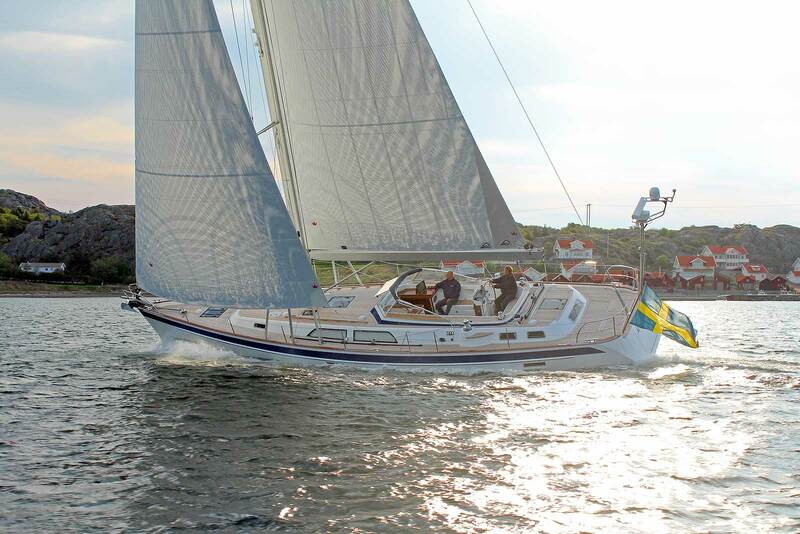 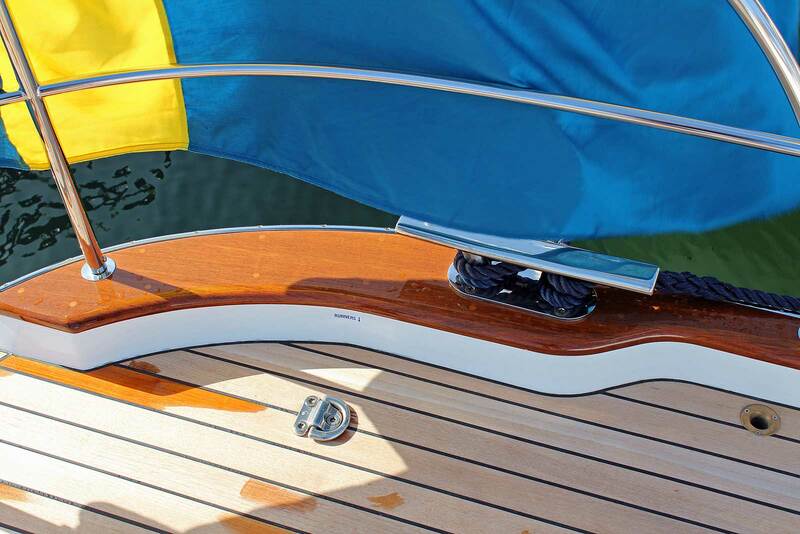 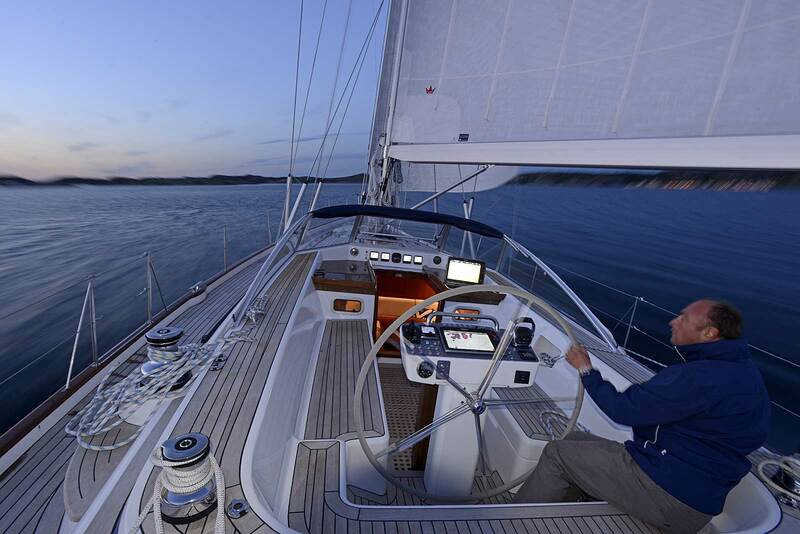 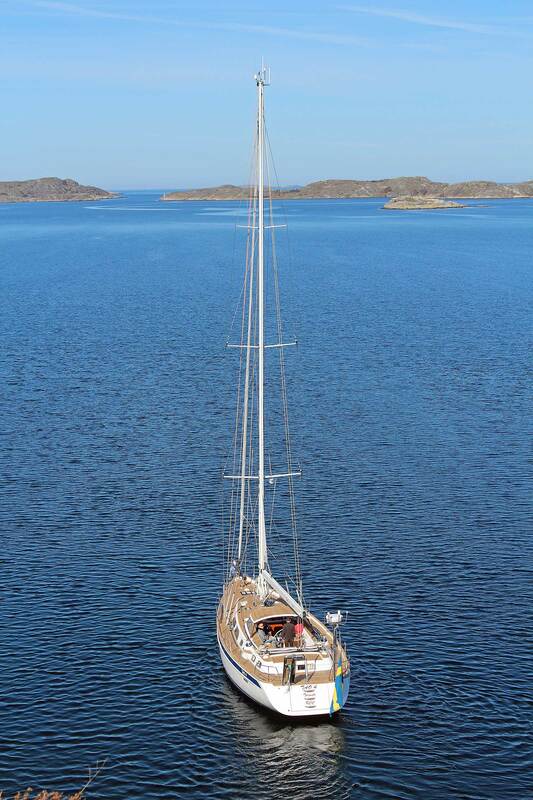 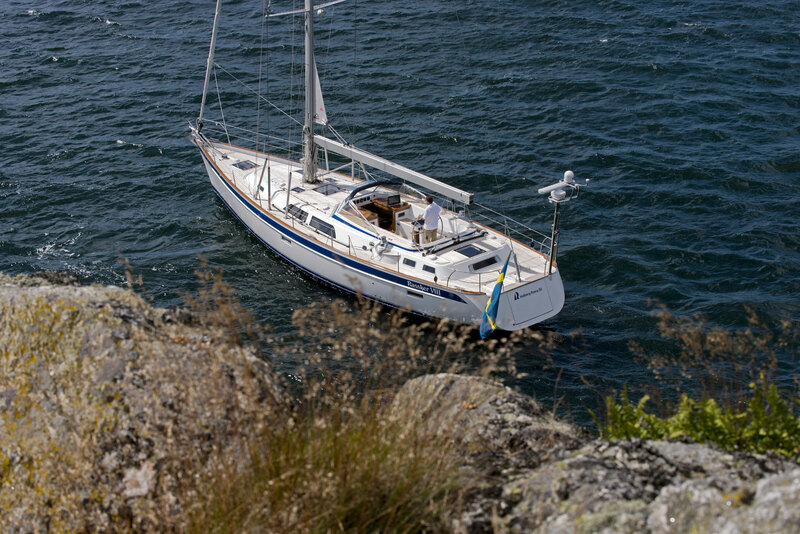 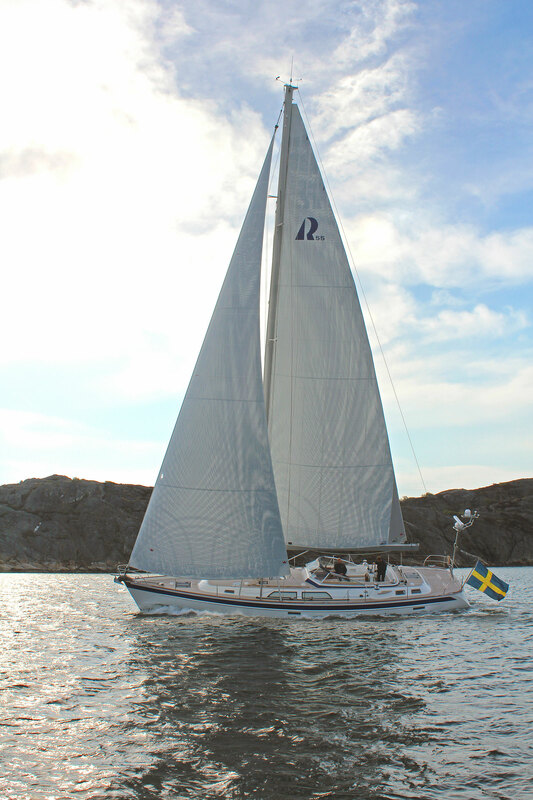 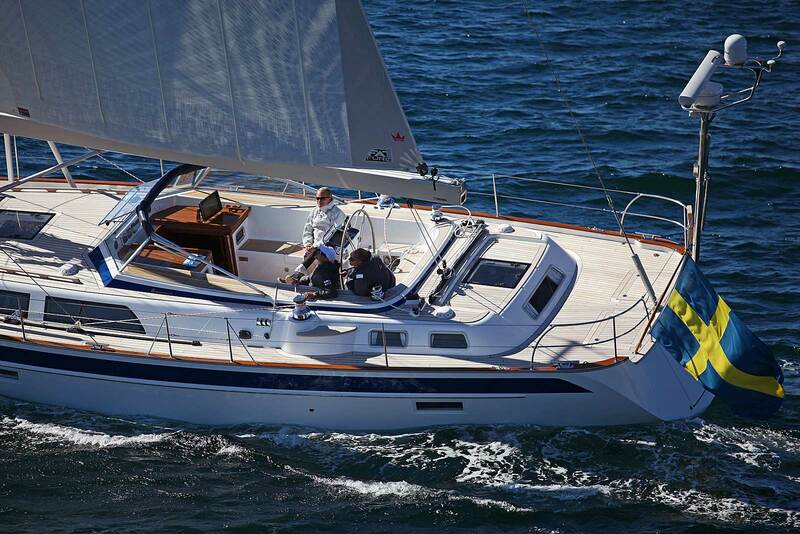 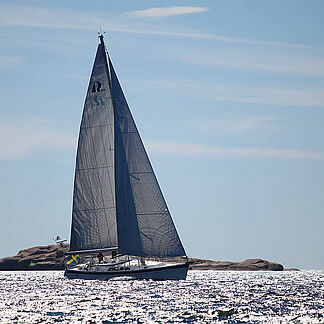 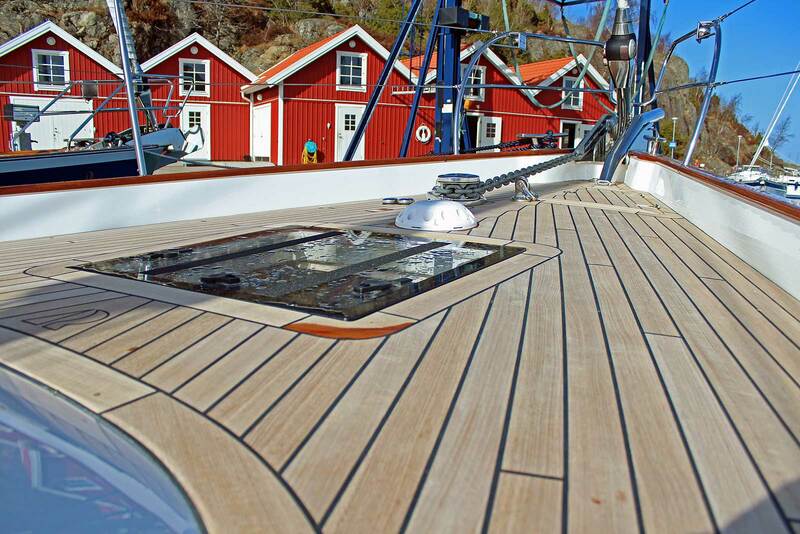 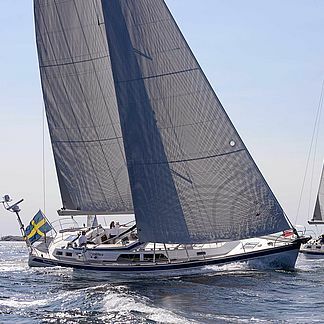 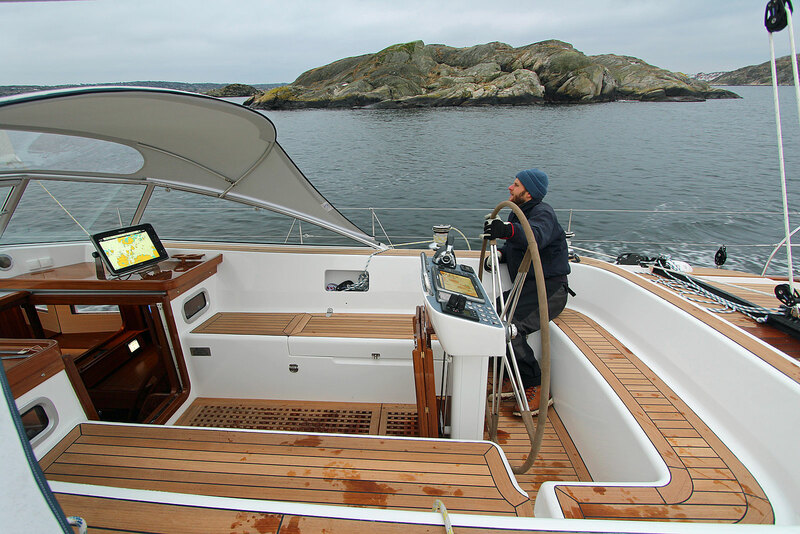 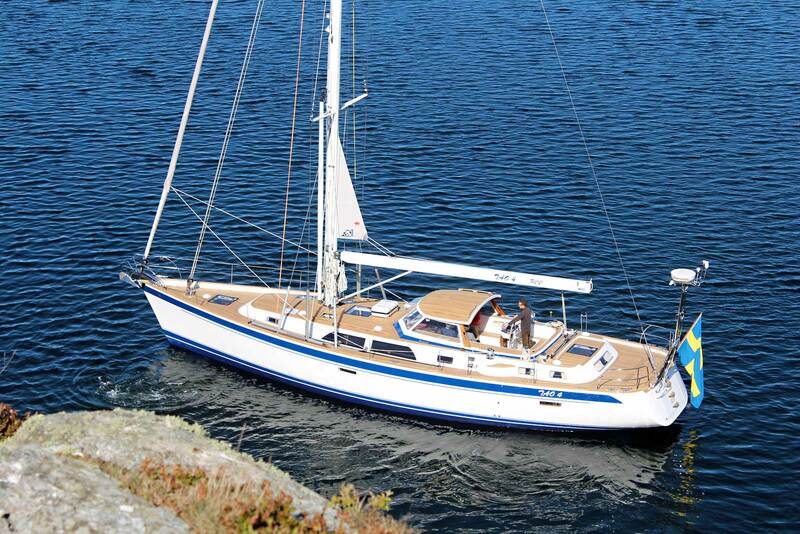 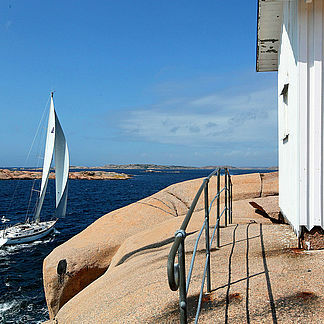 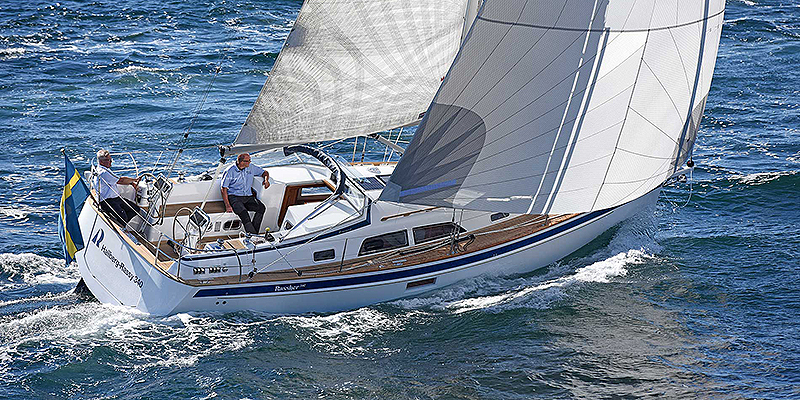 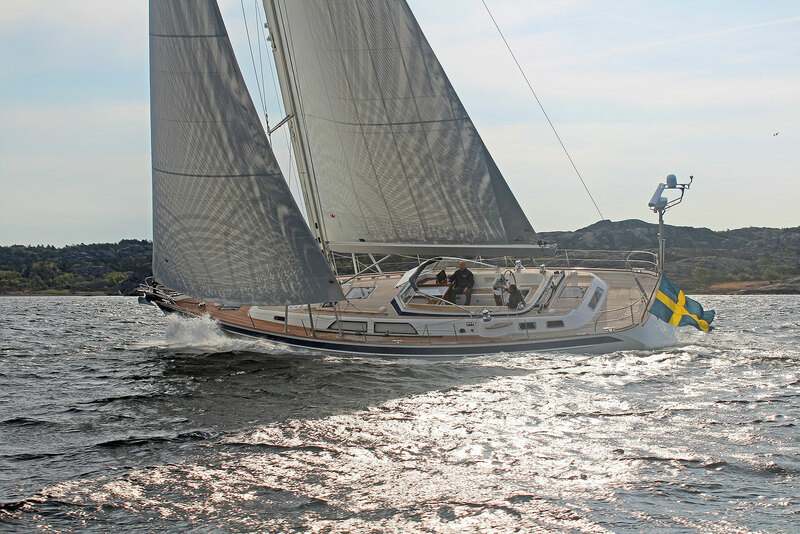 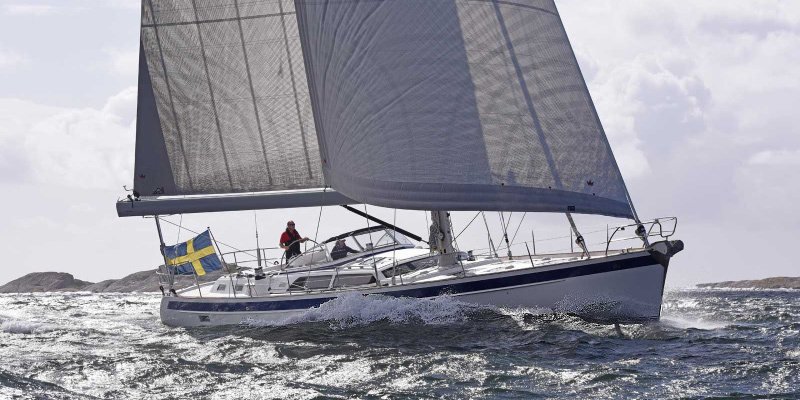 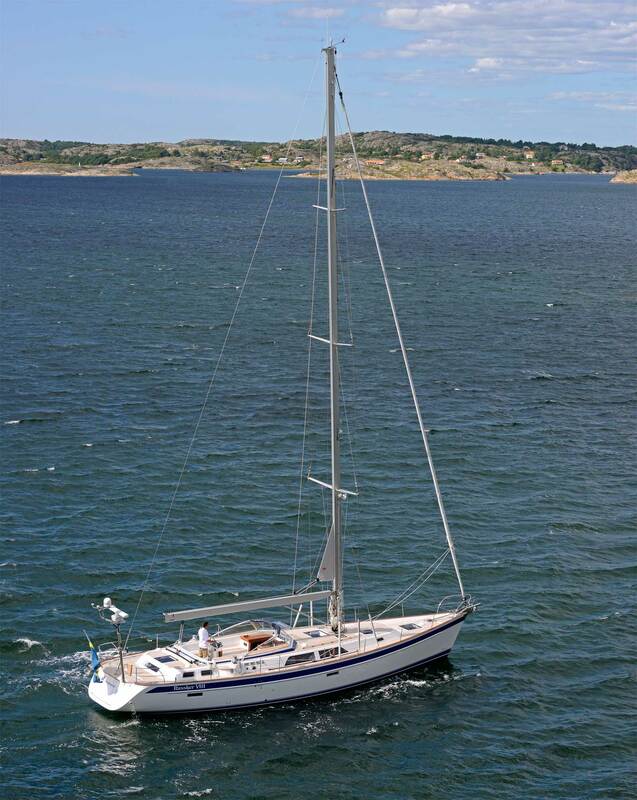 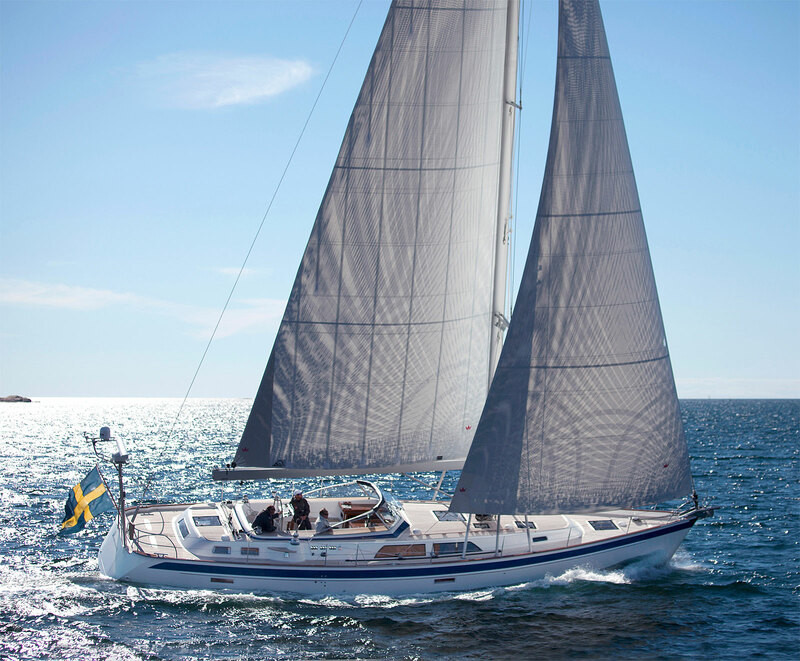 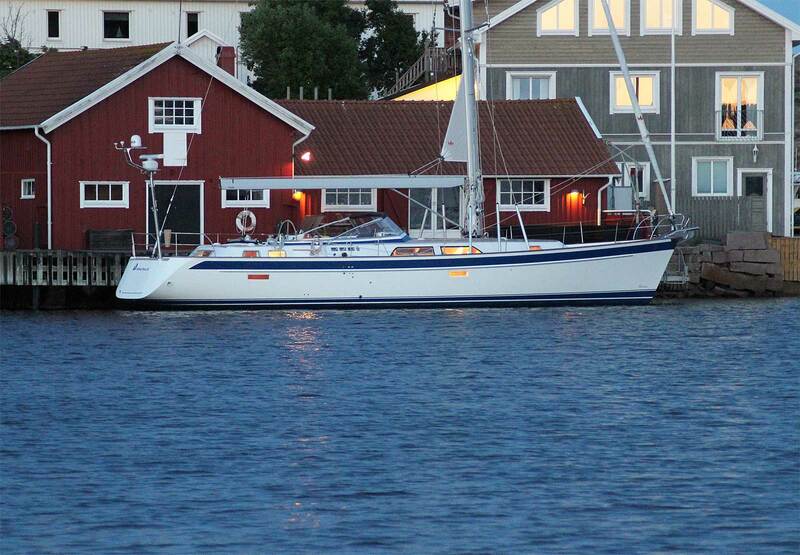 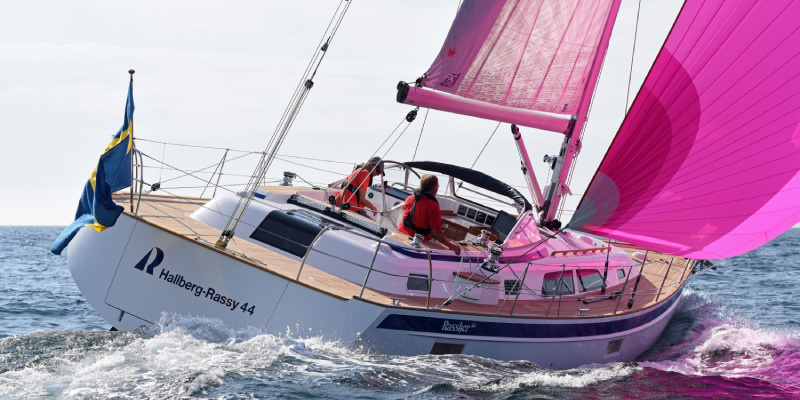 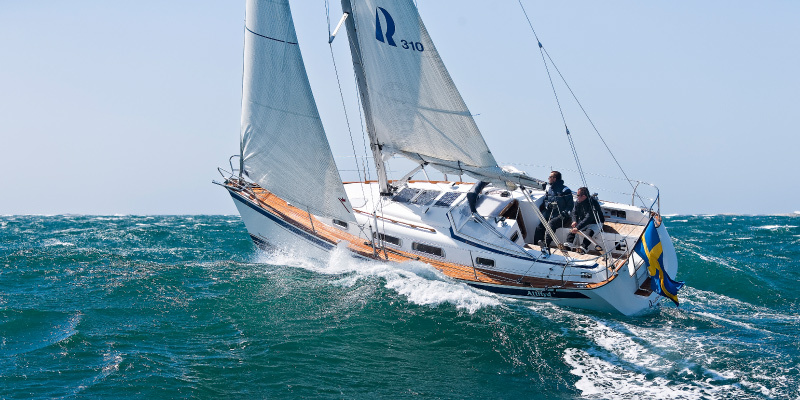 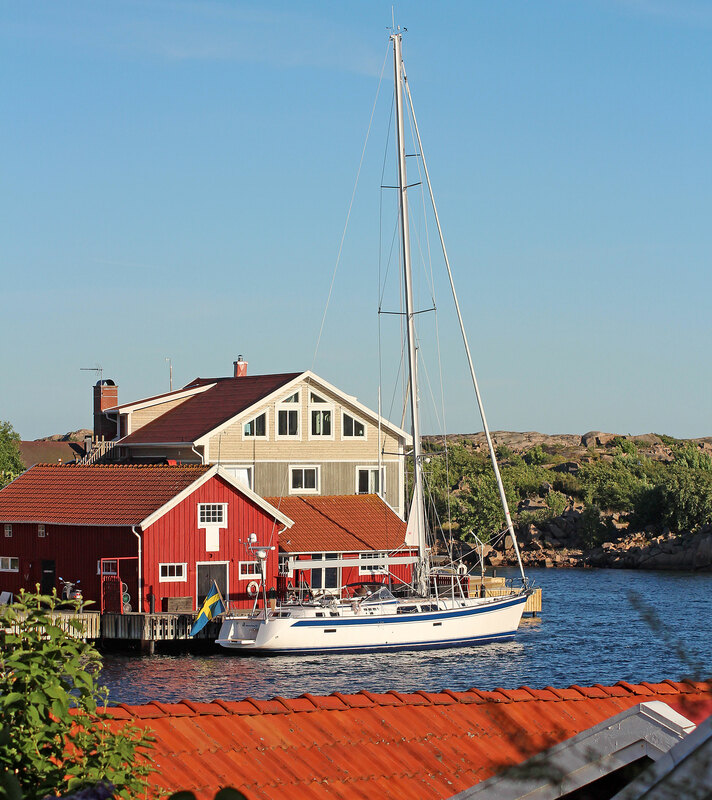 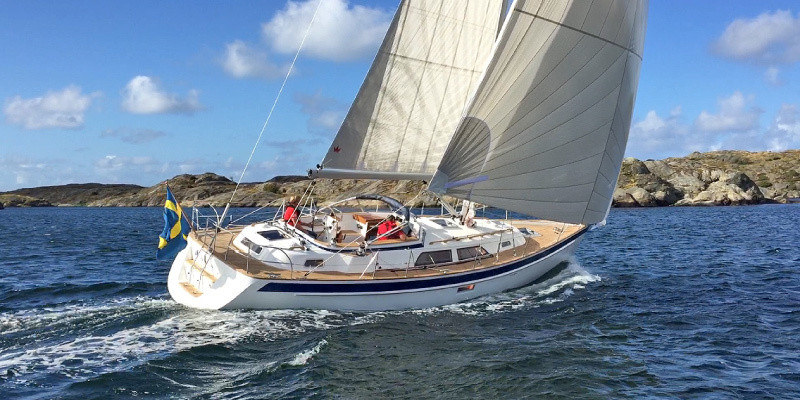 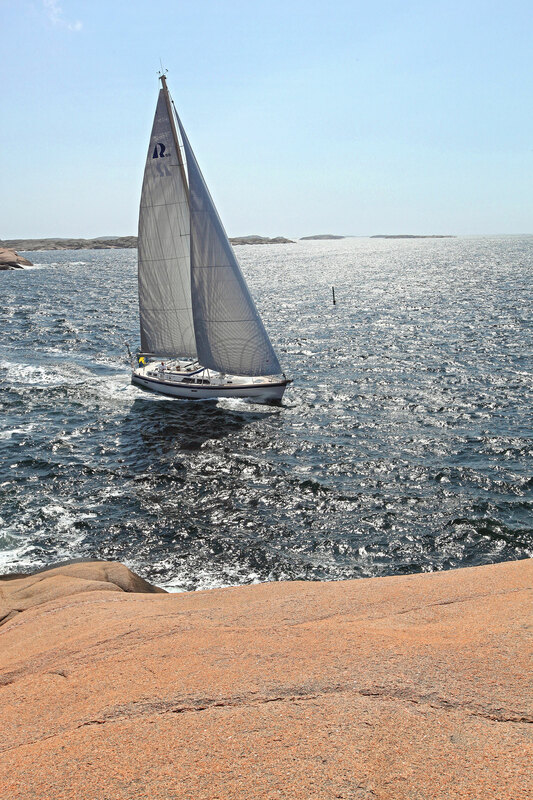 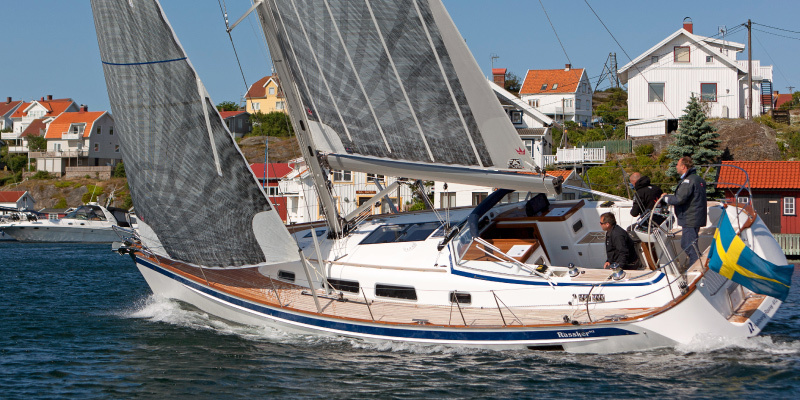 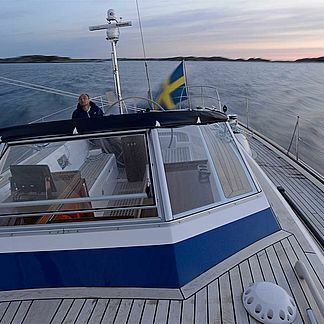 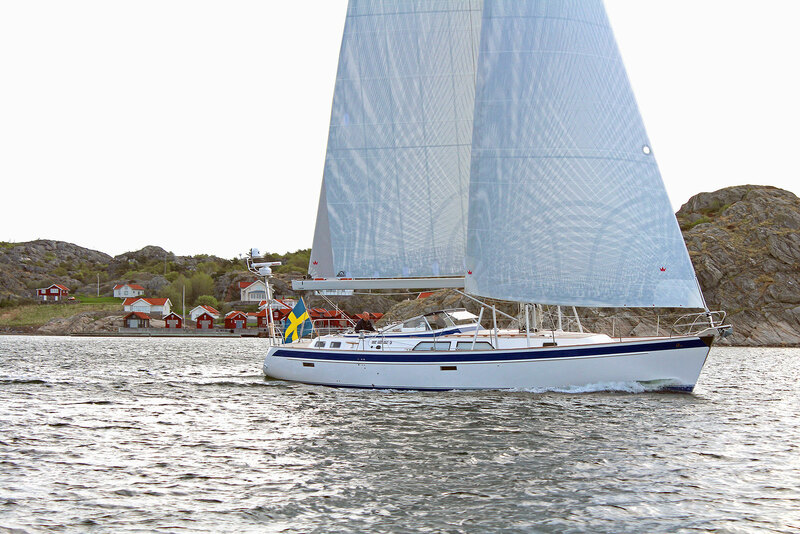 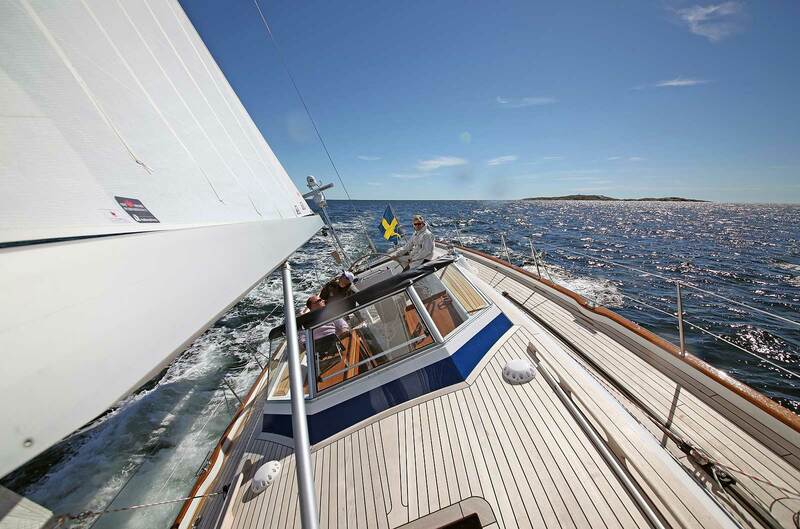 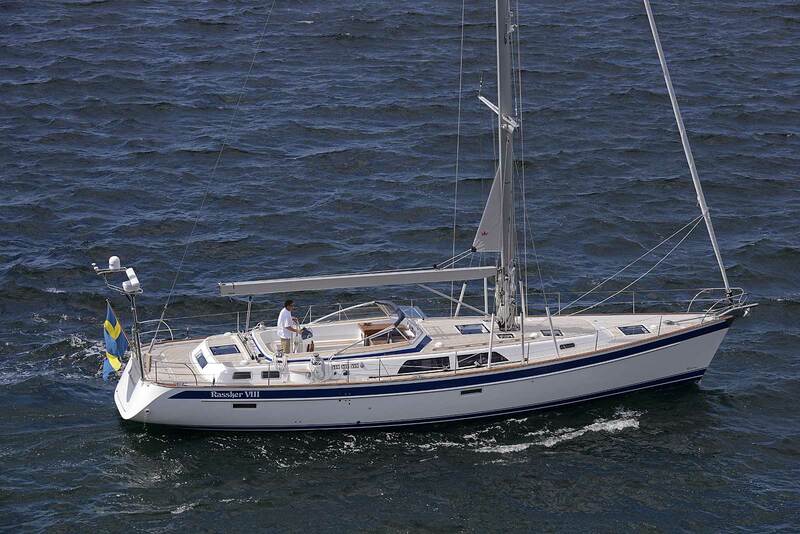 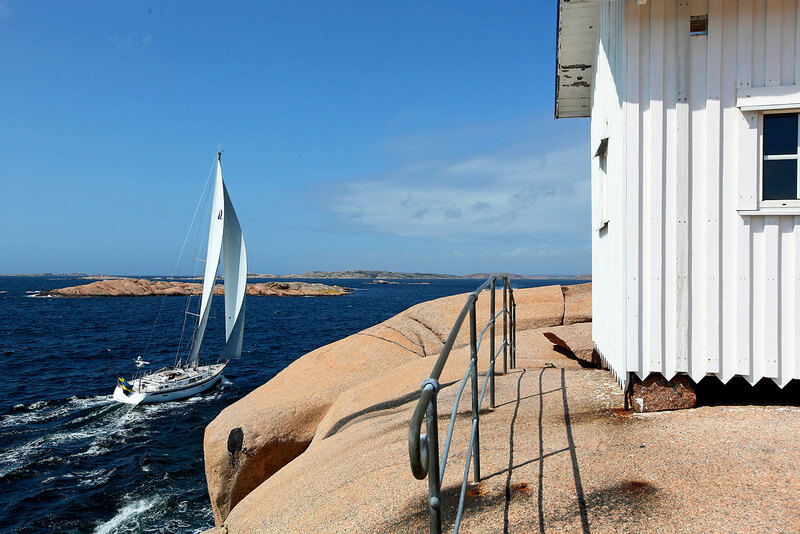 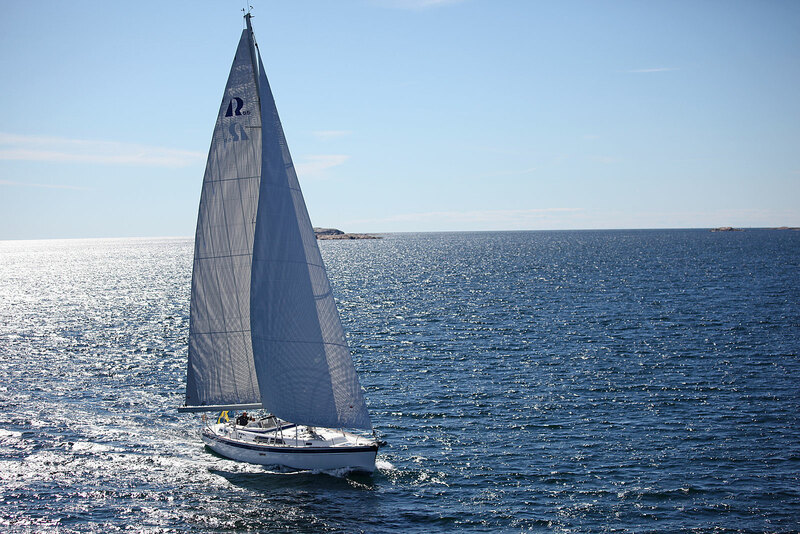 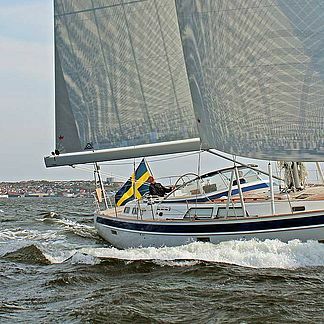 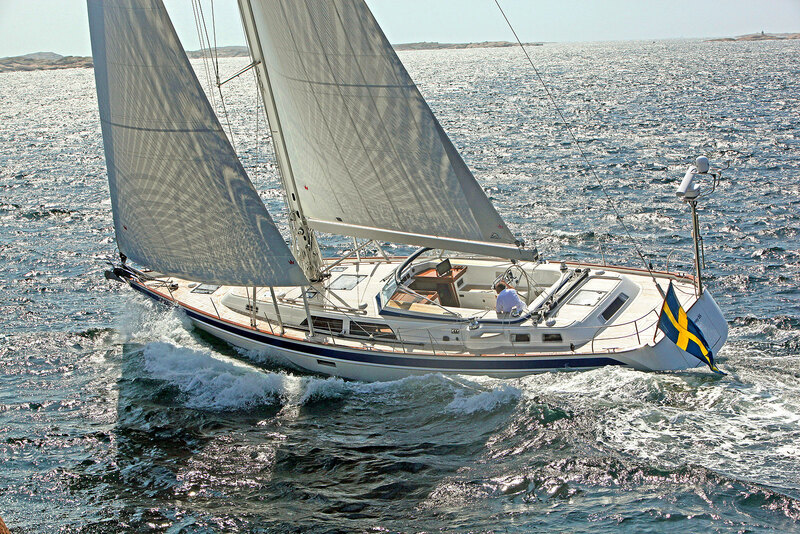 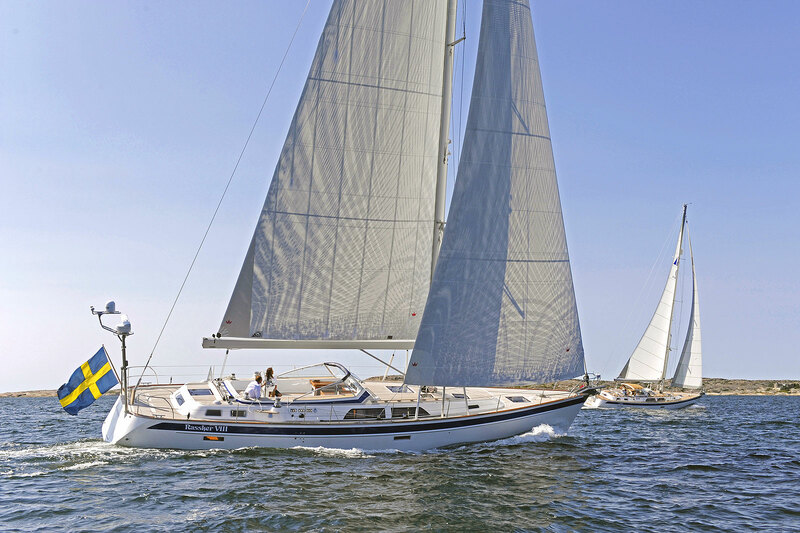 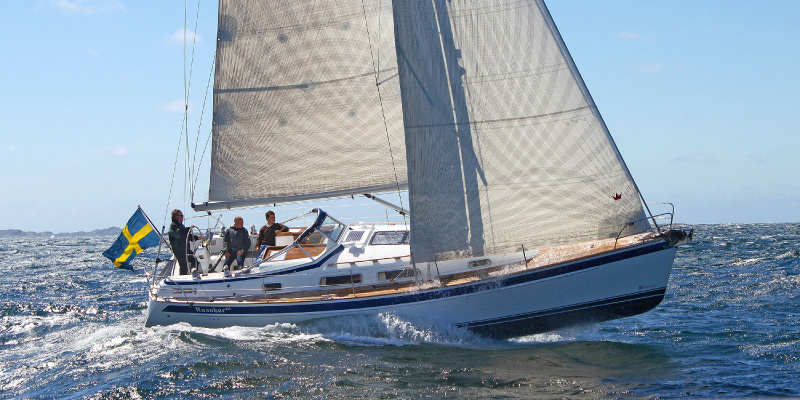 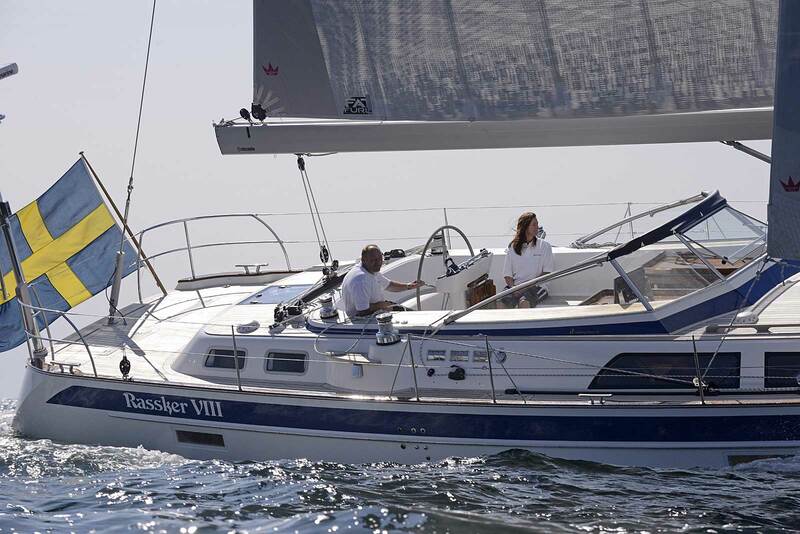 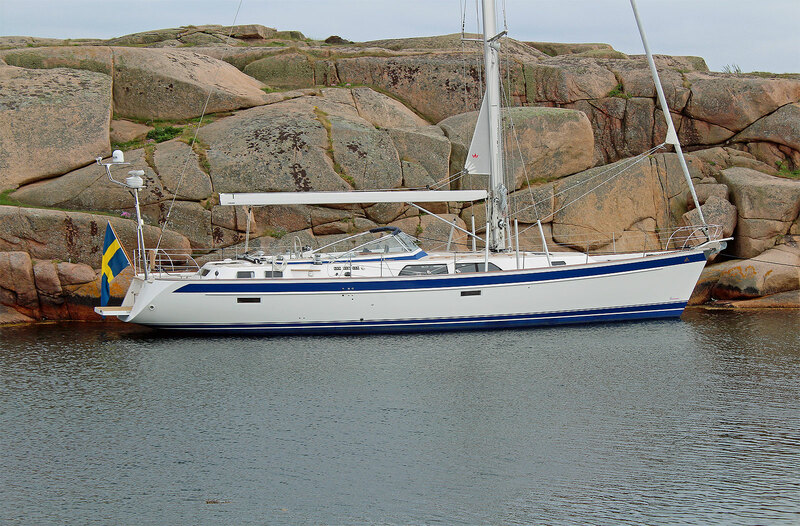 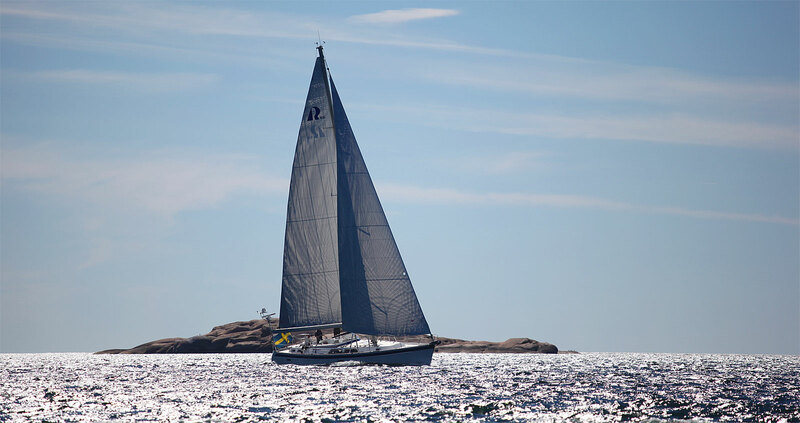 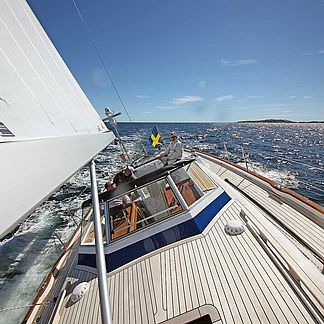 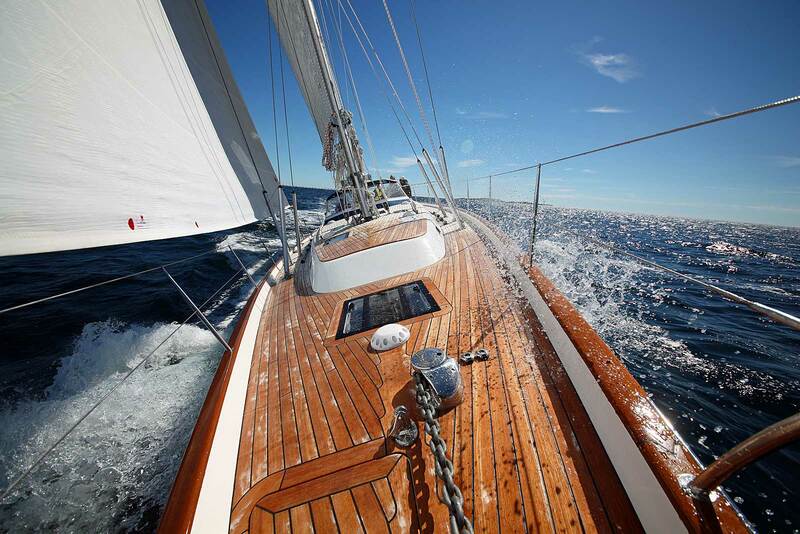 The Hallberg-Rassy 55 has won the honourable title Sailboat of the Year 2014 in Sweden, Luxury category. 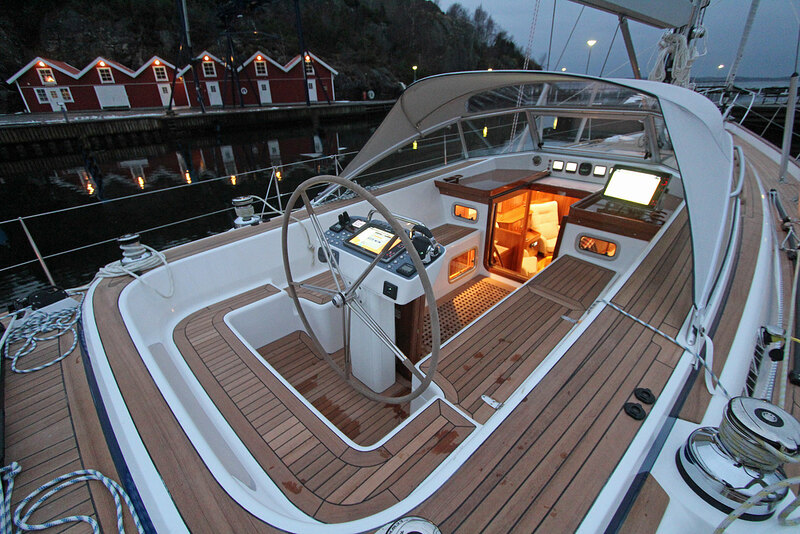 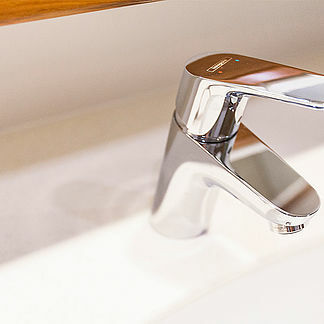 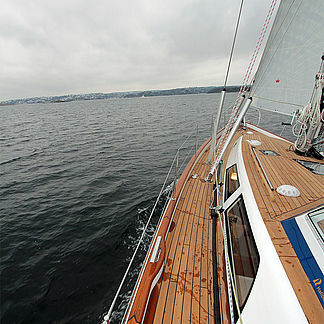 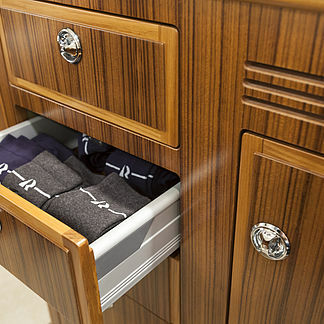 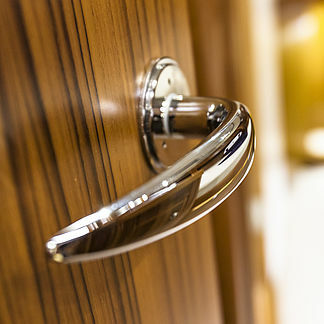 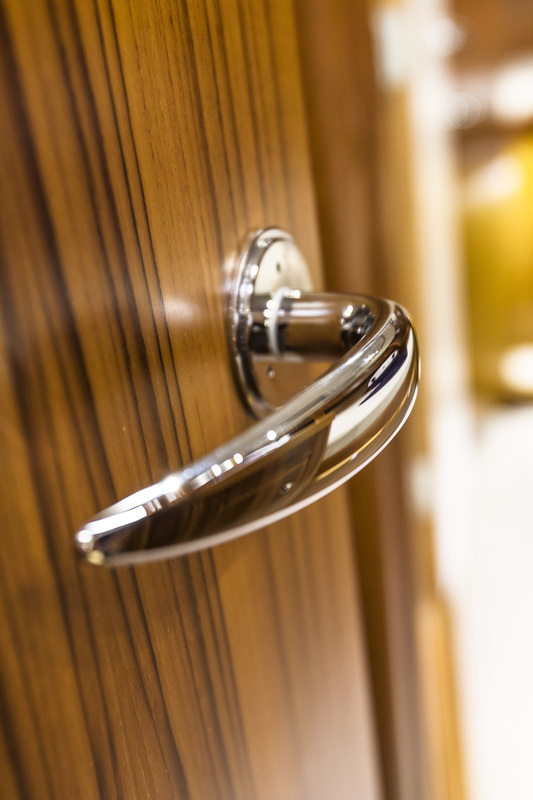 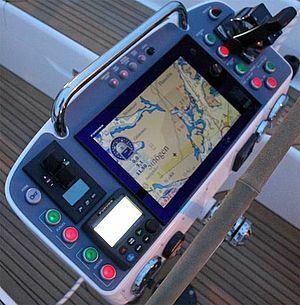 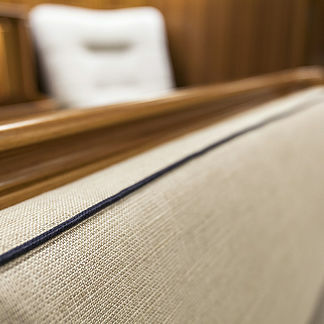 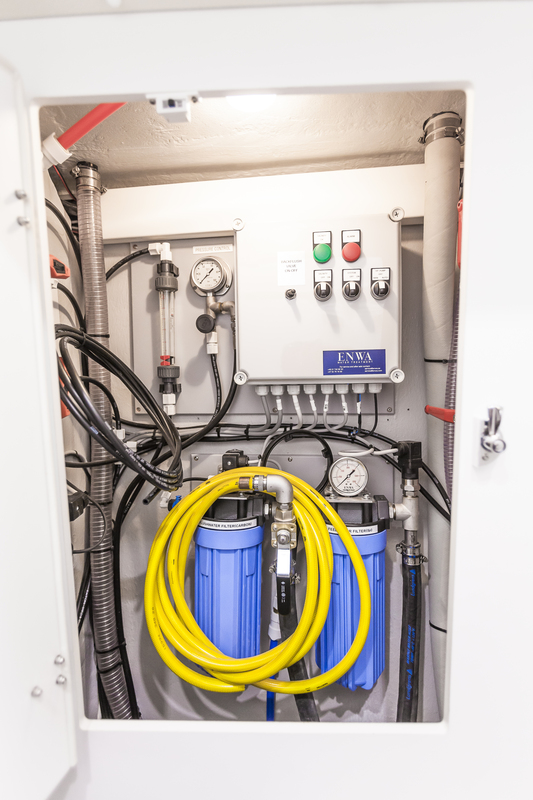 The jury concludes about the 55: "Luxury blue water cruising at a new innovatory level". 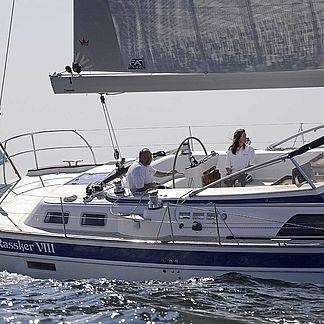 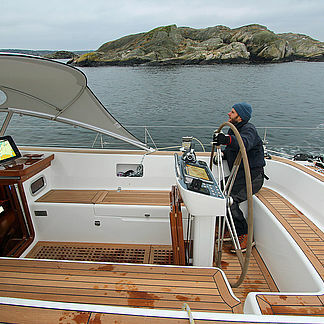 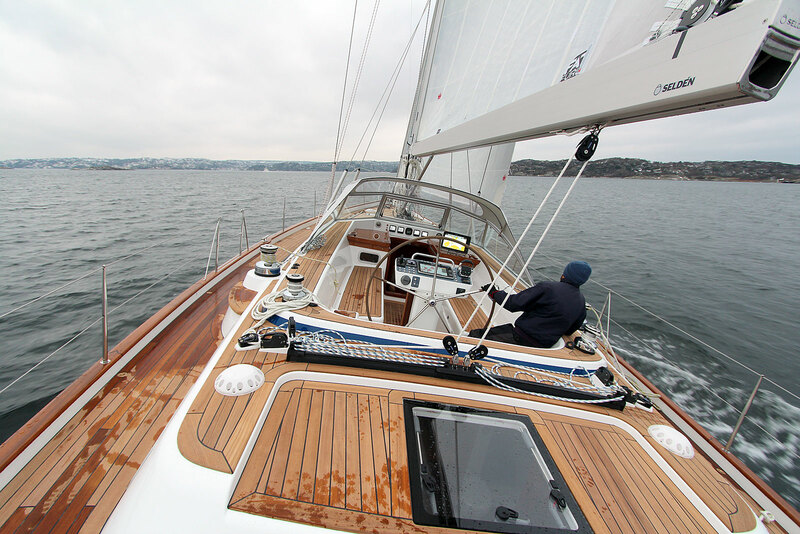 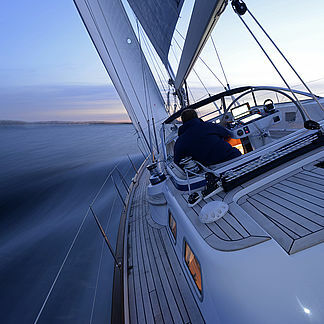 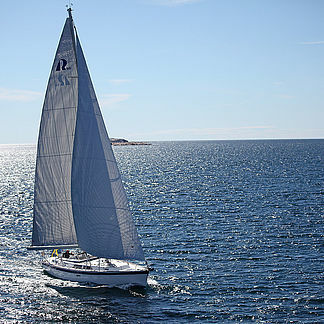 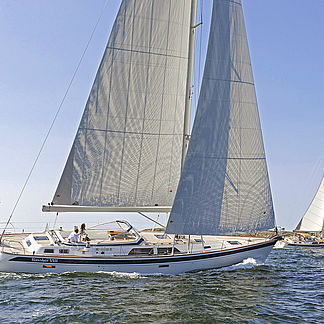 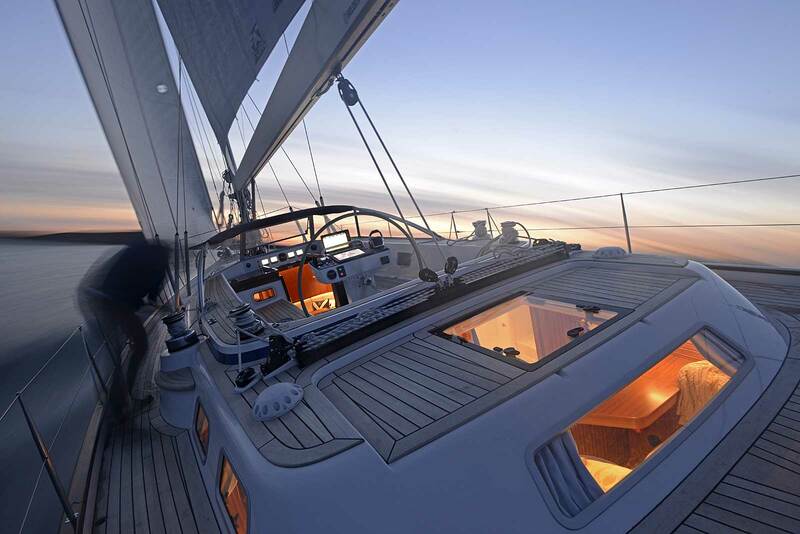 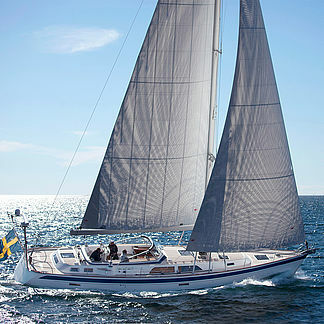 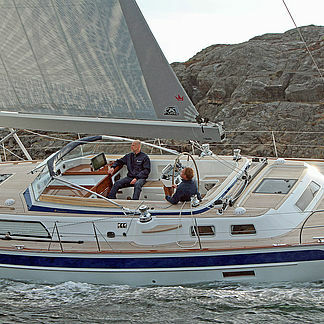 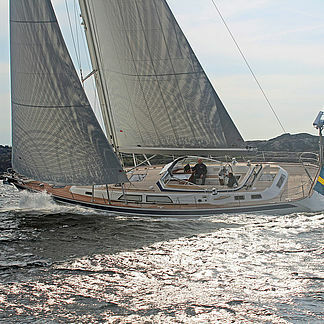 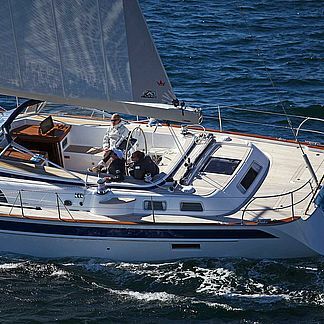 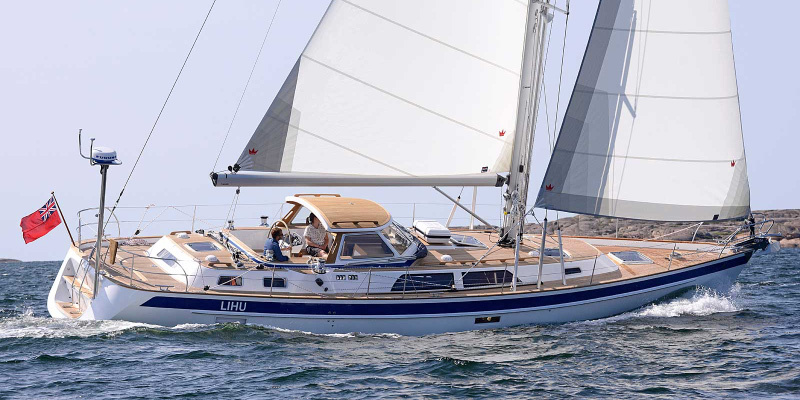 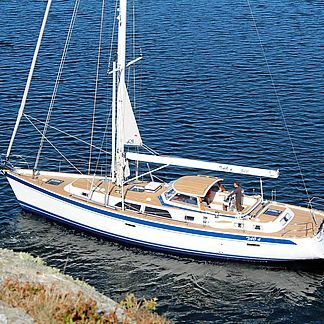 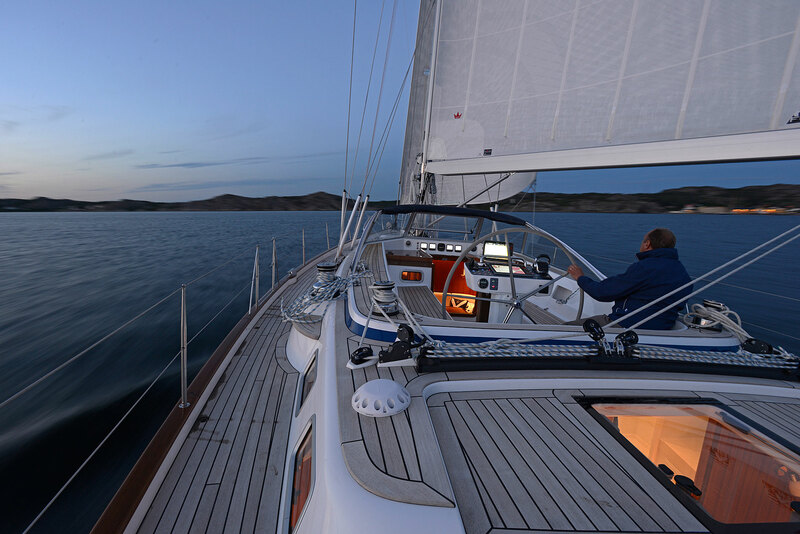 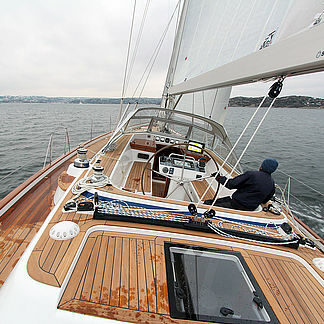 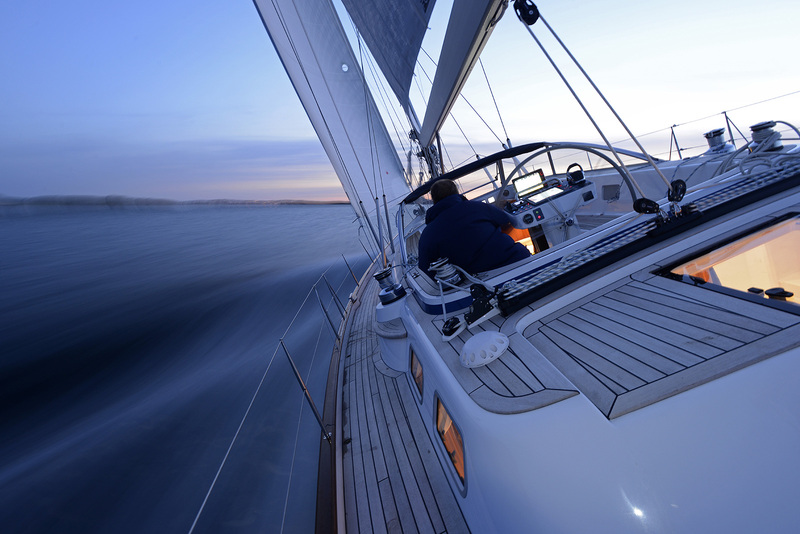 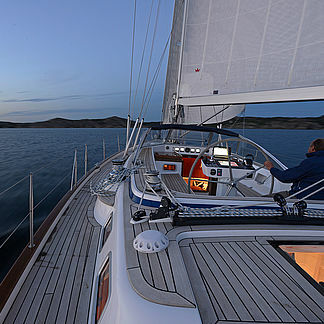 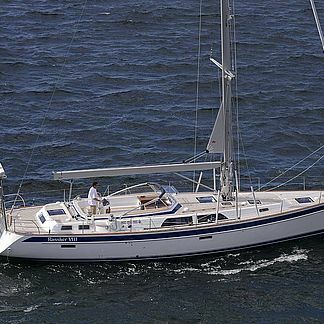 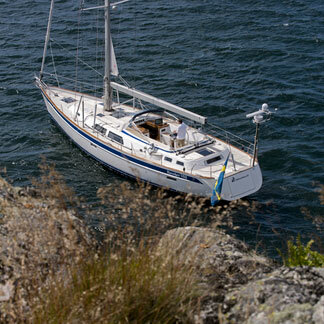 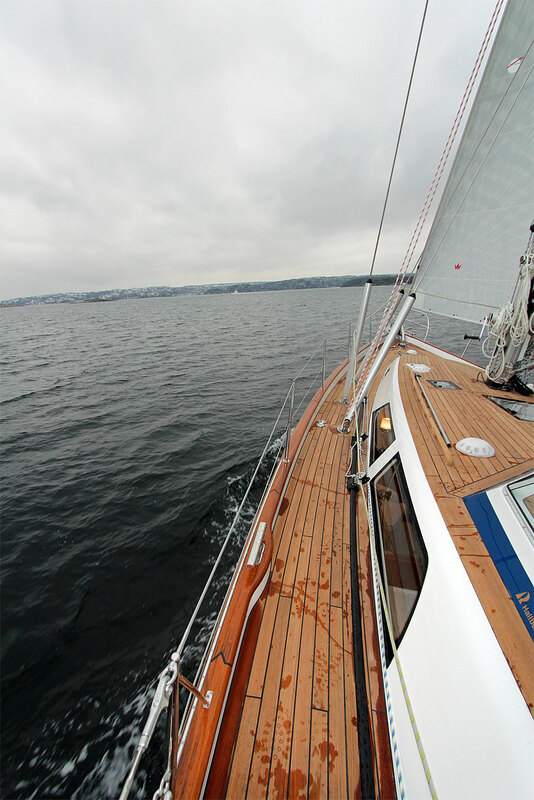 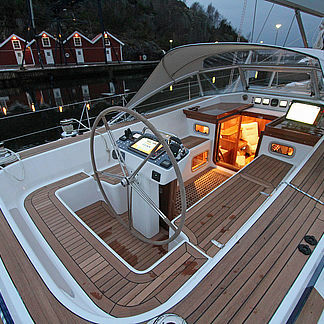 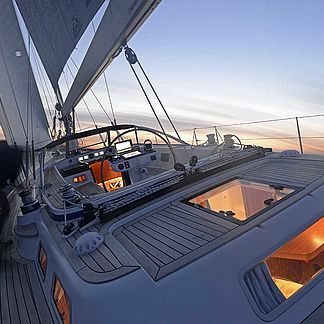 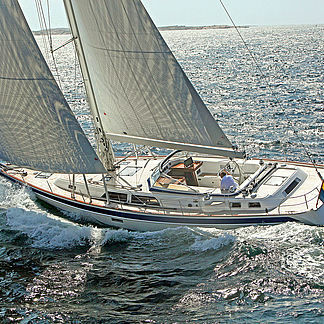 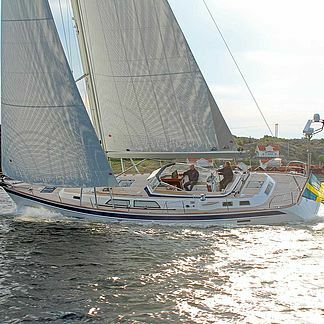 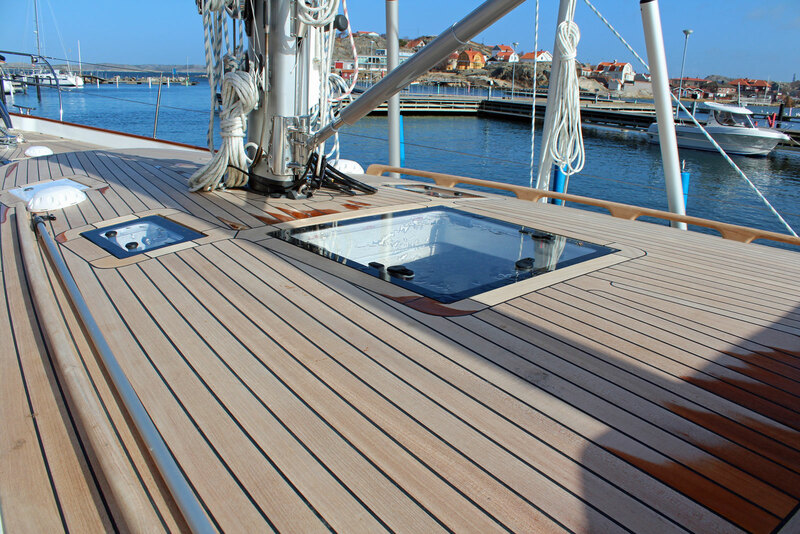 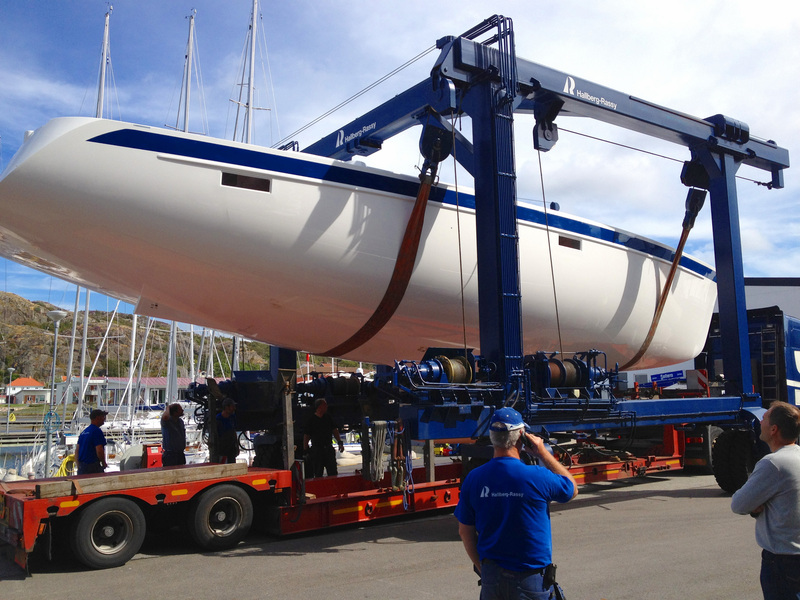 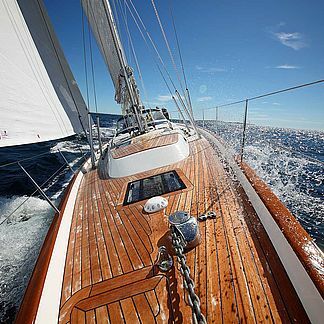 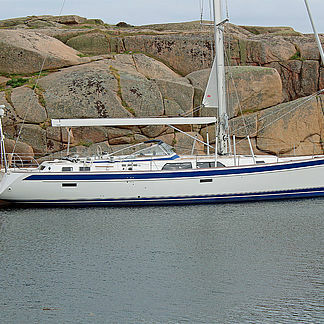 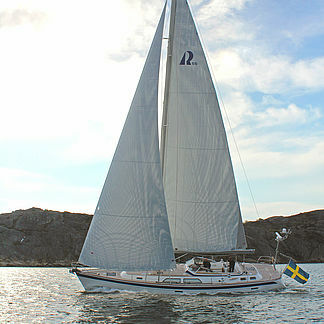 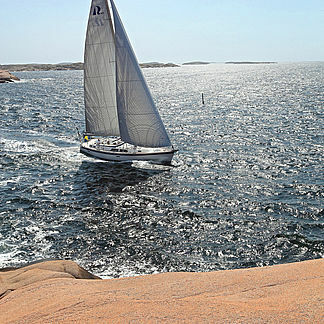 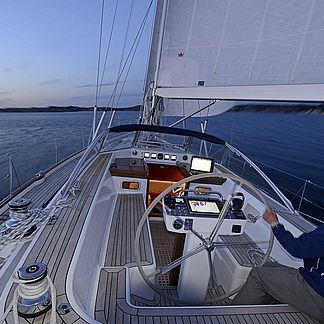 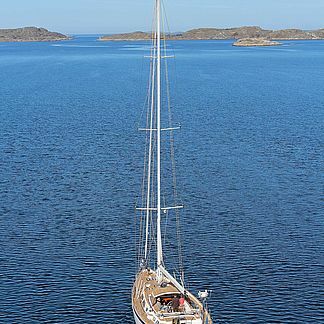 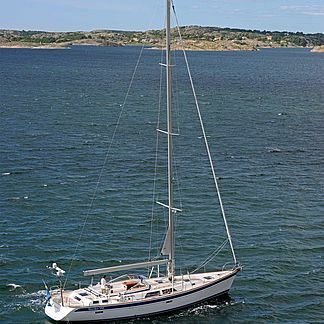 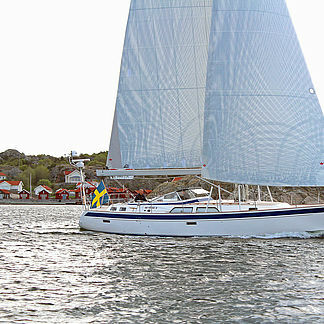 The Hallberg-Rassy 55 has also been nominated to the European Yacht of the Year 2013/2014 in the category "Luxury cruiser". 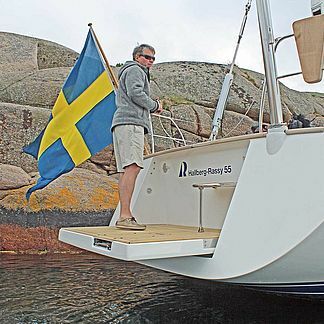 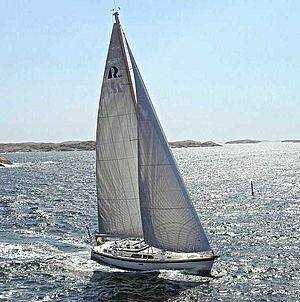 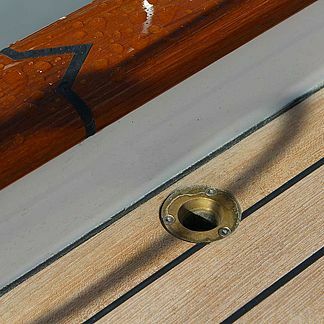 That means that the Hallberg-Rassy 55 has been ranked as one of the most interesting and promising newcomers of its class. 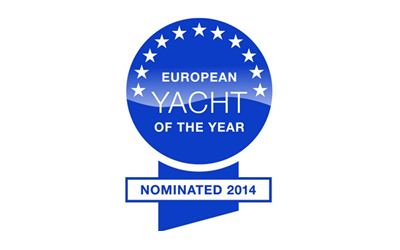 The nominees for European Yacht of the Year award are selected by journalists from eleven European yachting magazines. 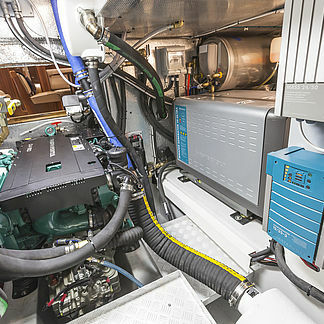 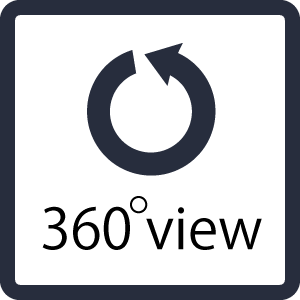 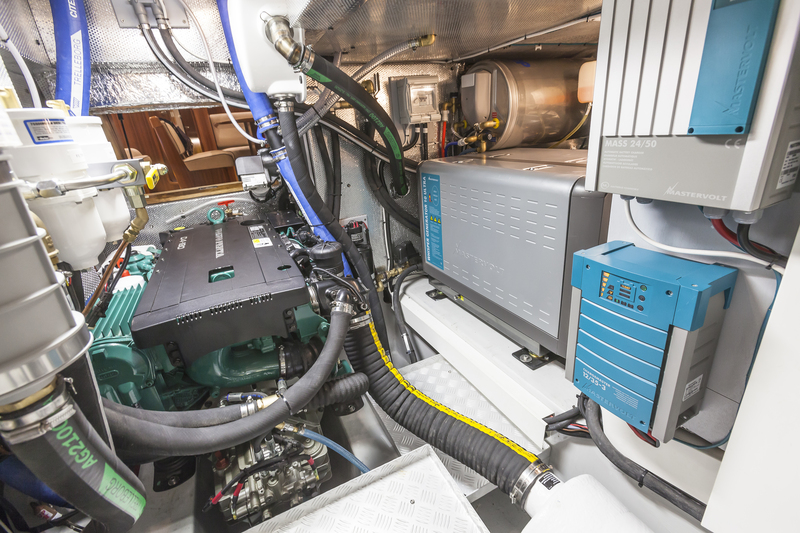 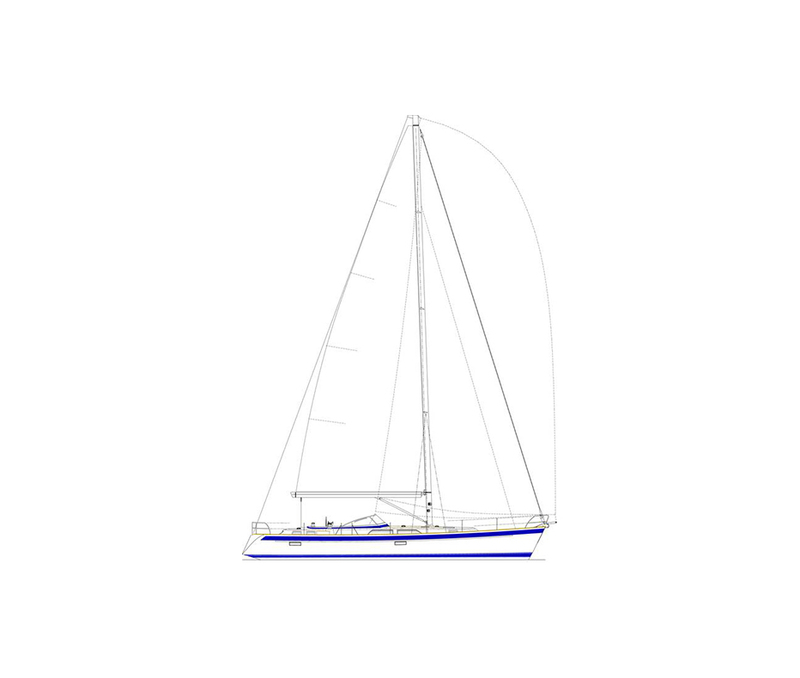 To see a 360 degrees virtual reality view of the Hallberg-Rassy 55 saloon, aft cabin, aft heads, supercabin, engine room and cockpit, please follow this link. 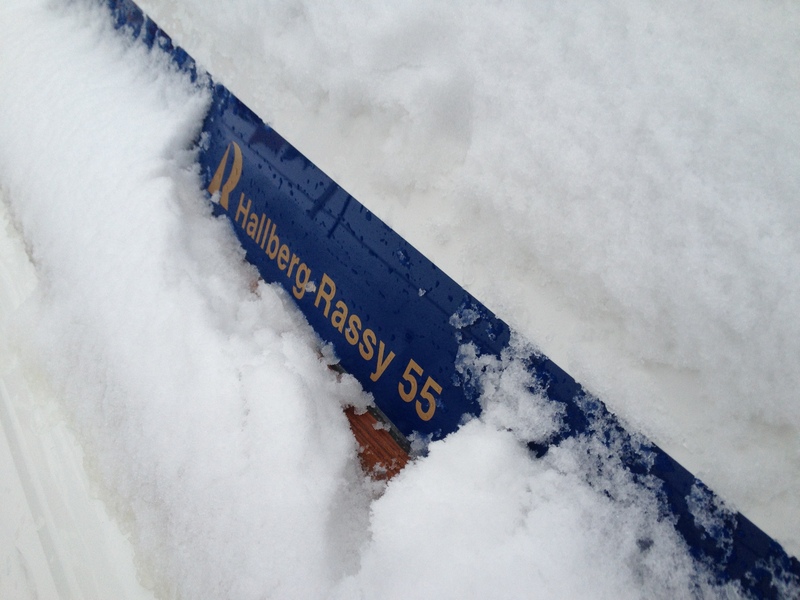 16.68 m / 54' 9"
14.30 m / 46' 11"
4.69 m / 15' 5"
4.73 m / 15' 6"
24.50 m / 80' 5"